This thread shall take the place of BOTH the old Japan and Osaka threads. no matter where in Japan you intend to go to. pex_japan is a collaboration of those people who frequent the old japan and osaka threads. Hello and welcome to the all-new Japan thread! Every day, more and more Filipinos want make Japan their new holiday destination. Majority, however, have no clue on how to go about it. There is a website that is considered the ultimate guide for travel to Japan, the appropriately called japan-guide.com. Some people however, still find its already simple layout confusing. This thread is mainly meant for, but is not limited to, such people. In this thread, we hope to present all the essential information that a first-time traveler would need when going to Japan. We may even toss in a few non-essential ones for good measure. It will be a venue for you, prospective Japan traveler, to ask or clarify, certain aspects or details of your planned trip. But before you continue reading, or even before you start posting, please be mindful of the following guidelines when using this thread. 1. Please be courteous when you post. 2. Please be clear on what you want to get through with your post. Practicing good grammar, either in Tagalog or English will help towards this end. 3. In line with #2, dont ask vague questions. Instead, make an outline of your itinerary and ask other people for their opinion or suggestions. 4. Please ADD A TITLE to your post. This will help other people search for the same topic/s as you are discussing or have discussed. Your concern might have already been discussed. 6. Use the search function. This will aid in zoning in on what posts should you backread. Thank the person who was kind enough to answer your post. Saying "Thank You" and not "TIA" will go a long way. 8. Did I mention that you ADD A TITLE!!? Please see the beginning of post #5 below for guidelines on how to compose a title. PLEZ LANG, READ THE WRITE-UPS ON THE FIRST PAGE before you continue to other parts or even, BAGO MAG POST. Lol! Japan, unfortunately, is a country that requires Filipinos to have a visa to enter into their country. How to procure one will however not be discussed in this thread. There is an appropriate thread for that. Questions about acquiring a Japanese Visa will not be entertained in this thread. you have to prepare enough funds to travel to Japan. What constitutes enough funds is the bare minimum needed to travel and stay in Japan. It should cover food, shelter, and transportation at the least. even if they should be part of your budget. Here now is the bare minimum amount you need to prepare for your trip. AREA OF COVERAGE -or- WHERE DO YOU GO? And by this, we mean what area or, more appropriately, what region should you go to given the amount of time you have traveling? 2) the Kansai region where Osaka, Kyoto and Kobe are, among others. If you have just less than a week to travel, we strongly suggest that you confine your trip to one region and its outlying destinations. You should consider going to both regions only when you can spare more than a week of your time. When planning on staying for more than a week, be sure that your wallet, too, can spare more than enough yen. lol. Each regions outlying destinations will be discussed together with the City Topics. Japan, owing to its geographical location of being in the northern hemisphere, experiences four seasons each year. The sights you will witness while traveling to this country will greatly depend on when you travel. Early Spring or Hanami Season - typically falls on the last week of March to the first week of April. Hanami is dedicated to cherry blossom (sakura) viewing. Late Fall or Koyo Season - typically in mid to late November. Koyo refers to the phenomenon of leaves changing in color from green to shades of yellow and red during this time. Other notable times of visit are during the holiday season, wintertime (January - February), and during summer (July - September). Expect the temperature to be high during summer and low during winter. During both Hanami and Koyo season, expect it to be milder. For a more detailed description on what temperatures to expect, take a look at the When to Travel page of japan-guide.com. So what do you wear? May we suggest something stylish? Leave your hole-riddled t-shirt behind. Seriously, what kind of clothing you should bring will depend on your own tolerance to cold weather. While it might be a burden to bring that extra jacket, it might be an even bigger inconvenience to walk around feeling cold. As a general rule, typical MANILA temperature hovers around the 28 - 32°C range. BAGUIO weather on the other hand is much cooler, with temperatures hovering around the 22 - 27°C range, even falling to the upper to low teens at night. With these in mind, consult websites that forecast weather of Japanese cities and prepare accordingly, using Manila and Baguio temperatures as reference. Japan is a country that receives its fair share of rain. The rainy season (Tsuyu) more or less falls between the months of JUNE and JULY. Typhoon season is recognized as a different weather phenomenon and typically occurs during the months of AUGUST and SEPTEMBER. However, no matter when you intend to travel outside of the winter months, always be ready for some rain. If you come unprepared, rest assured that you can readily buy disposable umbrellas from the nearest konbini. Japan offers a wide variety of options on where you can lodge while on holiday. from popular budget hostels to not so popular (yet) capsule hotels. Nowadays, you can even rent rooms or flats from private individuals via AirBnB.com. Tripadvisor, Expedia, Orbitz, Booking.com, and the Japan-specific Japanican.com, among others. You are expected to book a place where you can stay as soon as possible. especially on popular periods of Travel (eg. last week of April - the first week of May, New Years Day). As a general rule, it will be beneficial to you as a traveler to book a place at the center of the city. This will give you better access to both dining options and attractions. If it cannot be helped, particularly when budgetary concerns come into play, try to book a place that is near a well situated train station. This will at least easily connect you to places of interest. Keep in mind too, that different accommodations may have different encumbrances. A traditional ryokan will offer futon mats instead of a bed. An older establishment may be equipped squat type toilets. Hostels may offer shared rooms and toilets. Specific recommendations where to stay will be/ may have been discussed in the city narratives that follow. Japans form of currency is the Yen (¥). All establishments in the country transact in their currency alone. Majority of establishments do not accept credit cards. Only the bigger stores and hotels offer that convenience. You are therefore expected to have Yen when you travel to Japan. Where do you exchange for Yen? You can exchange your Pesos or even your Dollars for Yen either before you leave for, or after youve landed in Japan. In the Philippines, you can purchase Yen at the bank or at moneychangers. I have observed through the years that moneychangers offer a better rate than banks. Examples of moneychangers are Czarinas and Sanrys. If you decide to forego purchasing your Yen before you leave, you can do so at the moneychanger at the airport. Outside of the airport, you can do the same at a bank or at an ATM. I havent had the chance to exchange for Yen in Japan as Ive always bought Yen before I leave at Czarinas main branch in Makati. I can report that the rates at Czarinas were much more favorable. This section will pertain to traveling within Japan. How to get to Japan from the Philippines will not be covered. This section too, will tackle the general rules of traveling. For area specific details (eg. routes, what train to take, passes), kindly refer to the posts on specific regions or cities. If the Jeepney is king of the road in our shores, in Japan, traveling by rail is hands down the most popular option. Traveling by rail incorporates both train and subway systems. When used together, you can practically reach any destination in Japan. Well, almost. Expect your trip to be punctual, and your ride comfortable. Japans railway system, both trains and subways, is mainly composed of private companies both big and small. The biggest of them all is the Japan Railway Company (JR) whose trains encompass the whole of Japan. Other smaller railway companies service smaller areas, often connecting two or three cities with one another. and Hankyu Railways, connecting the cities of Kobe, Osaka and Kyoto. Think of Japan Rail as being like our Philippine National Railway (PNR), albeit a million times bigger and more efficient. Unfortunately, we do not have smaller railway companies in the Philippines. Come to think of it, the PNR is comparable to the smallest Japanese rail company. Aside from the trains, cities often have a network of subways that crisscross its boundaries and everywhere else in between. These subway trains are akin to our LRT and MRT but travel almost exclusively underground. Take note however that subways arent the exclusive means of rail transport within the city. Just like how the PNR also offers a line traveling within Metro Manila, train companies like JR also operate lines within the city. JR actually operates the popular loop lines that encircle both the cities of Tokyo and Osaka. Now that you have an idea of the complex system of train companies, lets focus our attention on what do you do to ride a train or the subway. 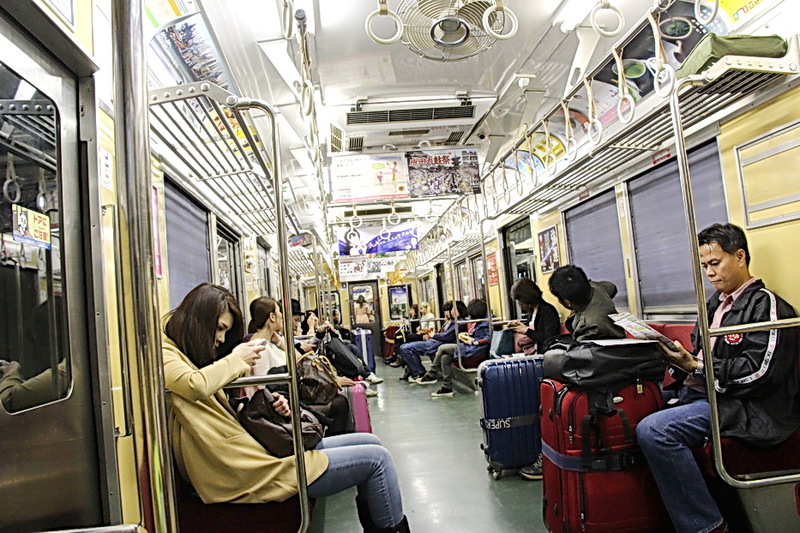 Just like we do in the Philippines, when riding either the LRT or the MRT, you can purchase an individual ticket to ride a train or subway line in Japan. The only difference is that the individual ticket here in our country takes the form of a pliable card with a magnetic strip that we insert in the turnstile at the station of departure. In Japan, the individual ticket is an actual ticket that you likewise insert in the ticket gate. Image taken from [url]http://blog.ofjapan.jp;[/url] credits to owner. Image taken from [url]https://markystar.files.wordpress.com;[/url] credits to owner. Again, like here in the Philippines when riding the LRT or the MRT, you too, have the option of purchasing a prepaid card in Japan. However, unlike here where the prepaid cards look exactly like the individual-ride cards, the prepaid cards in Japan arent pliable and are actual cards (think credit cards). They have ICs that you just tap on the ticket gates reader as you enter the station. that are valid on all regular trains regardless of the train company operating that line. For example, in Tokyo, JR stations sell the Suica prepaid card while non-JR stations sell the Pasmo prepaid card. You can however use the Pasmo card for travel in JR trains and use the Suica card on non-JR trains and the subway maintained by the Toie and Metro companies. While you can use the prepaid card to pay for your fare on almost all regular lines, you cannot use it to pay for limited express trains (ltd. exp). To be exact, the prepaid card will allow you entry on the ltd exp. train as it will pay for its base fare. However, you will need to pay for the supplementary fee either before hand in the ticket counter or to the train master inside the train. This is what we dont have in our country. and may offer varying degrees of discounts when traveling in a certain period of time. Why buy an individual ticket? If you dont see yourself as traveling much, purchasing tickets on a per-ride basis may prove the prudent option. For one, you wont have to pony up the ¥2000 to purchase the prepaid card. Two, if you dont use up the value stored in your card, you lose ¥220 when you reimburse that remaining amount in the way of a handling fee. Why buy a prepaid card? If you foresee yourself using public transportation a lot, purchasing a prepaid card may prove to be the wiser option. This will afford you to get on the train or subway without scrounging for money to purchase tickets every time you ride. When do you buy a train pass? Buying a train pass is tricky due to its limitations and its price. Of its known two limitations, the time within which the pass is valid is of less concern. For majority of passes however, working around which train lines are covered by the pass is often the more bothersome limitation. Different passes are valid for a specific number of days. Its price directly reflects the number of days it can be used. Be aware that a day of usage typically means a given calendar date and not a 24 hour time period. A one-day pass initially used at 4:00 pm will be valid till 11:59 pm of that same day and not 3:59 pm of the next day. Moreover, these train passes dont cover all train lines. Different passes are offered by different train or subway companies and are often valid only on the train lines they operate. For example, the Toei subway company sells a one-day pass that offers unlimited subway rides on all 4 of its subway lines in Tokyo. You cannot use this to get on the subway lines operated by rival Tokyo Metro. Still other passes are offered as a city or area pass and are valid for use on majority of that citys or areas trains and subways. In the Kansai area for example, one can purchase the Surutto Kansai Pass that allows travel on all subways, trains and buses except those operated by JR.
and whether or not you will take enough train rides so that the total cost of all those rides will approximate the amount you paid to purchase the pass. The main reason we purchase a pass after all is to be able to save. If a pass does not offer a monetary advantage, it doesnt make any sense to purchase it. A prepaid IC card will do the trick in such an instance. Figuring out whether a pass will pay off or not is easy enough. There are a number of online sites that help you compute the price of a trip, none more important than Hyperdia.com. 2) take note of each trips cost. to make an informed decision on whether to purchase the pass or not. From the above data, you can now see that buying the pass will not pay offfor you and therefore, you shouldnt buy the pass. Earlier, we were able to establish that different train companies run different lines- some connect areas within a city, others connect cities. Each line in turn, runs different kinds of trains, which vary in the amount of time it takes to complete its journey. Some are faster; some are slower; mainly depending on the number of stops the train needs to take. and a fast ltd. express that stops at only the major stations in between the origin and final destination. often carrying the names like rapid, special rapid service and express. To illustrate, the JR Kyoto Line can be used to travel from Osaka to Kyoto and vv. The line includes, but is not limited to, travel between Shin-Osaka Station and Kyoto Station. Different kinds of trains ply the JR Kyoto Line at varying speeds. takes 20 minutes more (factual) than the ltd. express train that doesnt stop at any station at all. Not of particular importance but still worth mentioning, the no. of stops isnt the only factor that determines how fast you travel. The actual speed of the train also carries weight. the Haruka Ltd. Express and the Ltd. Thunderbird. While the latter takes 24 minutes to travel that distance, the former does it in 2 minutes less. However, the fastest of them all has to be the Shinkansen, which covers that same distance in just a scant 14 minutes. Special mention has to be made of Japans iconic bullet train, the Shinkansen. It is the fastest train that you can take (it runs on a different set of tracks than the other trains) and makes travel between cities a breeze. and to go through the pre-boarding rituals, travel time between the two evens out. The Shinkansen is run by the different subsidiaries of Japan Railway (JR) and thus, may have different names, reflecting different classes. Each class, just like the regular trains, stop at various numbers of stations, thus affecting total travel time. Central JR company runs the Tokaido Shinkansen Line that services the important Tokyo-Osaka corridor. It has 3 classes of bullet trains, listed from fastest to slowest: Nozomi, Hikari and Kodama. The Nozomi stops in the least number of stations while the Kodama stops at all stations in between those 2 metropolises. Riding the Shinkansen is expensive. As previously stated, a trip from Shin-Osaka station to Tokyo station and vv. will cost ¥13,800 one way. That is more than double the sleeper bus fare or even the regular train fare. However, riding it is highly recommended, as this might turn out to be one of the highlights of your trip. This is particularly so if you travel on a clear day and see the peak of Mt. Fuji as you zoom by. Priceless. You can figure out how much your fare is for a particular trip even before you travel with the help of the aforementioned website Hyperdia.com. But in case you didnt write it down or forgot it altogether, there is a way to figure out how much is your fare. If you have a pass or are planning to purchase a prepaid card, you can skip this, as it wont matter for you to know how much are you supposed to pay. If however you plan on subsisting on buying individual tickets, read on. Individual tickets can be bought in the ticket vending machines. They come in different amounts and the machine will prompt you to choose one. It is thus important to know how much exactly is the fare to travel from the station where you are in to the station closest to your destination. If you dont, you run the risk of underpaying, or worse, overpaying for your ticket. To know your exact fare, you simply look at the map on top of the ticket vending machines. *image from [url]http://www.eagle.pitt.edu;[/url] credits to owner. You then look for the station you want to go to and take note of the price listed beside it. Its that simple. *image from [url]http://www.chekyang.com;[/url] credits to owner. You can use the ticket vending machine to purchase a single-trip ticket. You can also use it to reload your prepaid card. To purchase a ticket, you must first determine your fare as described above. Once that is done, you insert money in the slot (A). The machine accepts both coins and bills. You then choose how many tickets are you purchasing (B). Last, you then choose the amount you have predetermined earlier (C). Get your change if any. *image from [url]http://mystudyabroad.blogspot.com;[/url] credits to owner. To reload your prepaid card, insert your prepaid ic card in its slot (D). If I remember correctly, the remaining balance should be displayed in the monitor. Press the charge button on the lower left corner of the screen. Choose amount you want to load (C). There are generally two kinds of buses in Japan: City Bus and the Highway Bus. The city bus operates within the confines of the city. It transports you from one area in the city to another area also within the city. Depending on what city you are in, you either enter in the front door or through the middle door. However, payment is almost always made by the driver's side. Some bus allow you to pay using your IC cards. Some, like the ones in Kyoto, do not. For those that disallow the use of IC cards, cash or a bus pass is needed to pay the fare. There is no need to scrounge for coins as most buses have a coin dispenser right by the payment slot, that can break your money bill into coins. Some bus employ a system wherein the fare is dependent on how far you travel. For these buses, you usually enter the middle door and get a ticket. You then show this ticket as you go down through the front and pay accordingly. Other buses employ a 'one fare for all' scheme wherein the fare is the same no matter how far is your distance of travel. For these kinds of buses, you enter the front and pay as you board. Those mentioned are by no means the only systems employed. Please take the time to research prior to departing if you foresee using the bus during your trip. The highway bus connects cities to other cities or towns and travel, as the name implies, through Japan's highway system. These bus normally have a designated bus stop within the city and you have to buy a ticket at the ticket office or even online before you even board for your trip. A famous example of a highway bus are the sleeper buses of Willer Express. They famously offer 'red-eye' trips between cities, like Tokyo-Osaka or Tokyo-Kyoto. Another category of buses that is neither a city nor a highway bus is the limousine bus . These buses typically service trips between the city centre and the airport. The cities of Tokyo and Osaka have them, originating from Narita and Kansai International respectively. What's there to be said of taxis? They are comfortable and convenient but, expensive. Consider taking one if the trip isn't that far and you are with 2 other people to split the tab. Do not, and I mean do not, take the cab for long distances like from Narita to Tokyo unless you are fine with blowing your budget for the whole trip. o Before posting, please backread even just a bit, there might be someone with a very similar itinerary posted just a few pages back. o Use the search thread function. [URL="http://<strong>http://www.japan-guide.com/</strong>"]japan-guide.com[/URL] - uber-comprehensive guide to Japan. A must-read for ALL visitors to Japan. Everything is written there, our aim is not to clone japan-guide here on PEX, but to complement the info there with our collective experience (and Pinoy point of view) here. [URL="http://<strong>http://www.hyperdia.com/en/</strong>"]Hyperdia[/URL] - train route and timetable search. This contains all train (and even plane) routes in Japan. The timetable database is updated annually to synchronize with most railway companies annual update. Advanced options such as an option to exclude non-JR trains for JR Pass users. Jorudan - simpler, less powerful (but accurate) train route search. Tags route options as Fastest, Cheapest, and Easiest. No option to exclude non-JR trains. Japan Meteorological Agency: One-week Forecasts, Daily Forecasts - valuable information that will tell you what to pack for your Japan trip and whether to take an umbrella or jacket with you when you leave your hotel. JAPANiCAN - hotel, ryokan, and tour booking. Also useful for discounted bullet train + hotel packages if you do not have a Japan Rail Pass. o Busy travel periods in Japan: The following are the peak holiday periods in Japan; visitors should expect packed trains, crowded tourist attractions, and higher accommodation rates. Cebu Pacific is the cheapest if you chance upon a promo fare (as low as PHP 5,800 rt to Tokyo); otherwise, all things being equal (baggage allowance and in-flight meals considered), it is a toss-up between CEB and PAL. Jetstar is another LCC worth considering when flying Manila-Osaka. JAL, ANA, and Delta are full-service carriers with a round trip ticket costing a few hundred dollars more than PAL. Currency is Japanese Yen (JPY). Most shops display this as ¥ or 円. The Japanese pronounce this as en as youll hear when they give your change when paying for something. Transactions are still mostly cash-based, credit cards can be used in big stores. Tip: To keep your coins from piling up, use them to pay for amounts with butal, for example, when paying for a 108 yen item in a 100-yen store, give a 500 yen coin plus eight 1-yen coins so that you'll get four 100-yen coins as change. Read more on how to apply for a Japan Visa and post your queries here. Details on where to exchange your PHP to JPY are provided in the previous post. I combined weather forecasts and packing into 1 bullet to emphasize that weather will play a significant factor in your packing needs. If you have made it this far, it is assumed that you already know that Japan has 4 distinct seasons and also has a rainy season (roughly June-July) and a typhoon season (peaks in September). 1 week before your trip, check the one-week forecast on the JMA site for your specific destination. The site shows the weather condition, min/max temperatures (very helpful), probability of precipitation or snow (very helpful as well). 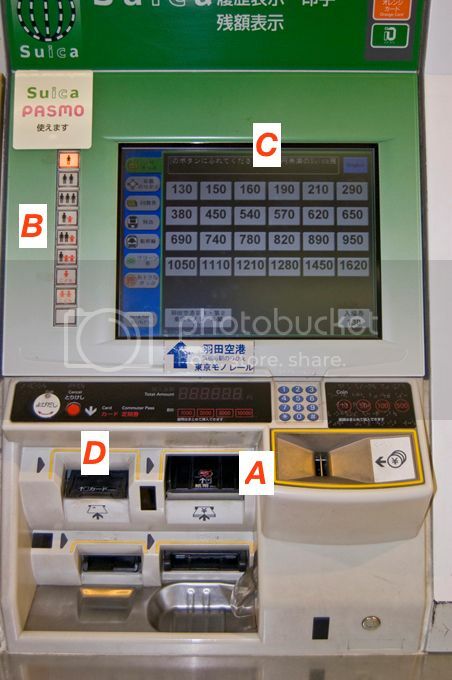 o Ticket vending machines: Paper bills are inserted one by one. Coins can be thrown all in one go on most machines. o Single journey tickets are idiot-friendly and can be inserted into the gate in any direction, unlike in our MRT/LRT where passengers fumble for the correct side to be inserted first. o Outside major urban centers, Takayama for example, human ticket inspectors take the place of automated ticket gates. Just show your ticket to the inspector upon entry. o Taxis make sense only for short hops and if there are 3 or 4 of you in a group. Flagdown is 600-700 yen, 80-90 yen per additional 300-400 meters. In most cases a train or subway station is within walking distance so avoid taxis whenever possible. o Do not take a taxi from Narita airport to central Tokyo (and v.v.) unless you want your 20,000 - 25,000 yen magically disappear from your travel funds. This also applies to Kansai and Nagoya airports, which are both 15,000  17,500 yen away from central Osaka and Nagoya, respectively. VI. Etiquette  Japanese behavior is governed by a lot of unspoken rules. Though foreign visitors are cut some slack if they misbehave, its worth knowing what these proper manners and etiquette are. As they say, when in Rome, do what the Romans do. o Conversation topics - Avoid discussions on WWII. Modern restaurants might have spoon/fork utensils available. Smaller and traditional restaurants are usually chopsticks-only. Do not pass food with your chopsticks to anothers. Eat one sushi piece in one bite using your hands or chopsticks. Slurping from ramen bowls or soup bowls is perfectly acceptable. For miso soup served on the side, sip the soup directly from the bowl. No soup spoon needed. Keep left on sidewalks, escalators, and while crossing the road. The right side is for those in a hurry ("overtaking lane"). In Osaka, above rule is reversed. Keep right on escalators. No smoking while walking. Light up only at explicitly indicated smoking areas. The Japanese have the highest smoking population of any developed country, so they are strict when it comes to smoking in public locations. Be aware of approaching bicycles, especially from behind. Bikers will signal their approach by a ding-ding bell. If you ride the train during rush hour in the cities, you WILL be squished. This is part of the Japan experience, so just enjoy and go with the flow. Personal space is very small on the train. Dont be offended if other passengers press against you on all sides. Unlike our very own MRT/LRT, in Japan the chance of you being victimized by a pickpocket is close to nil. Dont reach for your pocket when you are squished tightly, or you will be mistaken as a chikan (pervert). Give way to alighting passengers. If you are located at a door, get off and let passengers out. This courtesy is also observed by those waiting on the platform, they will not attempt to box you out when its time for you to get back in again. Switch your phone to silent mode. You will hear announcements repeated over and over to switch your phones to manner mode. No loud talking with your companions. You will receive glaring stares if you do. Tokyo is the busy, fast paced and ultra-modern capital of Japan. Together with the surrounding Kanto region (Kanagawa, Saitama, Chiba, Gunma, Tochigi, Ibaraki prefectures), it forms the largest metropolitan area in the world by population (~35 million). Arriving in Tokyo from a developing country such as the Philippines will come as a shock to some. In many ways the tourist infrastructure (transpo, facilities, service) are years or even decades ahead of us. This quick guide aims to help you, the PEX traveler, get the most out of your trip to Tokyo. First things first, how many days are needed for a Tokyo visit? Two to three days should be the absolute minimum when staying in Tokyo, excluding flight days, and that's just scratching the surface. Theme park days and side trips to elsewhere in the Kanto region are excluded from this count. Those with the luxury of time (and vacation leaves) should consider a full week in Tokyo to fully maximize their visit. I'm arriving at/leaving from Osaka/KIX and i want to include Tokyo in my itinerary. Can i include tokyo as a side trip for 1 day? Theoretically you can (via shinkansen). On that same line of thinking, you can also fly from Manila to Tokyo in the morning, have late lunch and photo op in Tokyo, and take the evening flight back to Manila. Sarcasm aside, kindly check the previous item. Flying to Tokyo: Haneda or Narita? Haneda (HND) is Tokyo's original airport 30mins from Tokyo station by monorail (90% domestic, 10% international). Narita (NRT) is Tokyo's main international gateway 1 to 1.5 hrs from Tokyo station (80% international, 20% domestic). It takes 1.5 to 2 hours, excluding check-in time allowance, to connect flights between Narita and Haneda. Long haul flights from North America land mostly at Narita, so if you're meeting someone arriving from the US/Canada, Narita is a good choice to arrive in. Furthermore, there are more flight choices to Narita (e.g. CEB flies to Narita, but not to Haneda) because landing at Haneda is more expensive for the airlines. Haneda caters mostly to domestic flights, so landing at Haneda will be more convenient if you're planning to connect to a domestic flight to elsewhere in Japan. From Manila, PAL, CEB, Delta, JAL, and ANA all fly direct to Narita. Only PAL and ANA fly direct to Haneda. Check and compare fares between airlines and destination airports when booking online. A flight to Haneda that costs the same as a flight to Narita on the same date is a better bargain. For those flying direct from Cebu, PAL and CEB only fly to Narita. Be sure to compare tax-inclusive fares between PAL/CEB before booking a promo flight. Generally, most travelers stay in the Shinjuku/Shibuya area for western-type hotels and the more spartan business hotels, and in the Asakusa/Ueno area for the cheaper accommodation options. The most convenient way to get into Tokyo from the airport is by train. Two rail companies operate train services from Narita: JR and Keisei. Each company operates different categories of trains, which are classified according to speed and on-board amenities (seats, toilets, luggage racks). In addition, JR and Keisei operate on separate routes and end at different stations in Tokyo, so which train to take depends on how fast you want to get to Tokyo and which general area youre staying in. If you know the station closest to your accommodation, just enter this into the destination box in Hyperdia. A note on using Hyperdia: use NARITA AIRPORT TERMINAL 1 or 2 as your starting station, NARITA is the station in Narita City, not the airport. For those staying at a family member or a friends place elsewhere in Tokyo, you can follow the directions above to a major station such as Tokyo, Shibuya, or Shinjuku, and search the rest of the route on Hyperdia. Those staying at major hotels may opt to take a limousine bus (around Y3,000). These buses leave from outside the arrivals area at drop you off at the hotel lobby or at a bus stop outside major train stations. Your luggage will be tagged and handled by the staff. Taxis are available at Narita, but because the one-way fare to central Tokyo costs roughly Y20,000, simply stick to the train or bus options described above and save your hard-earned cash for your other splurges. Speaking of splurges, another option described in the Narita airport website is by helicopter, which only takes 20 minutes from Narita to Roppongi. It will set you back Y270,000 though (not a typo). 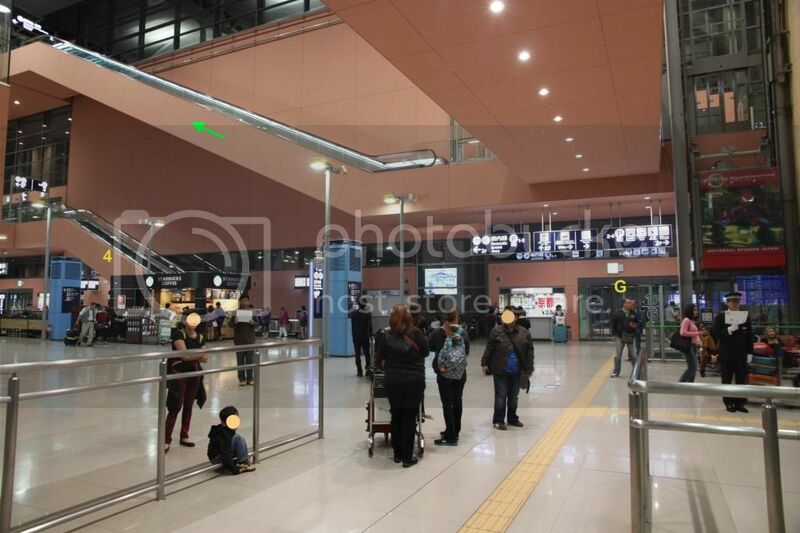 If you are arriving at Haneda Airport, there are train, limousine bus, and taxi options as well. By train: Two railway companies operate out of Haneda and end at 2 Yamanote line stations: Keikyu Railways terminate at Shinagawa Station are useful for access to Shinjuku/Shibuya area and Yokohama and Kanagawa Prefecture. The Tokyo Monorail terminates at Hamamatsucho Station and is useful for going to Tokyo Station, Asakusa, Ueno area. Only the Tokyo Monorail is free on the JR Pass and the JR Kanto Area Pass. By bus: Like from Narita airport, airport limousine buses are useful for those with heavy luggage because they drop you off direct at major hotels or outside major train stations. In central Tokyo, you're never too far from a train or subway station. The huge metropolis is crisscrossed by 13 subway lines, 5 JR lines, and close to a dozen private non-JR railways which are used to commute to Tokyo's suburbs as well as to Tokyo's 2 airports. The train map may look like a multicolored spaghetti plate, but the basics of getting oriented with Tokyo are actually pretty simple. The most useful JR line in Tokyo is the green-colored Yamanote Line, which runs around the city, connecting major centers Ikebukuro, Shinjuku, Shibuya, Tokyo, Akihabara, Ueno in a 1-hour loop. With the exception of the JR Chuo/Sobu line bisecting the loop from Shinjuku to Tokyo station, only subways operate inside the Yamanote loop. The various non-JR operators have their terminal stations at or near a Yamanote line station. Simply put, if the LRT from EDSA-Taft to Roosevelt and the MRT from North Avenue to EDSA-Taft were one, single, continuous train ride, the resulting loop distance would be very similar to the Yamanote line. Shinjuku, Shibuya, and Tokyo station would correspond to various stations on this loop. Before exiting a subway/train station, look for a map which shows the location of sights in relation to the station exits. It is frustrating to climb a flight of stairs only to find out that your destination is on the other side of a wide avenue. When you type "Asakusa" in the "from" field of Hyperdia, three stations are shown in the drop-down. How do you determine which is which? The first option is the Asakusa station of Tobu Railways and Ginza/Asakusa subway lines, which are located fairly close together as you can see on the map. 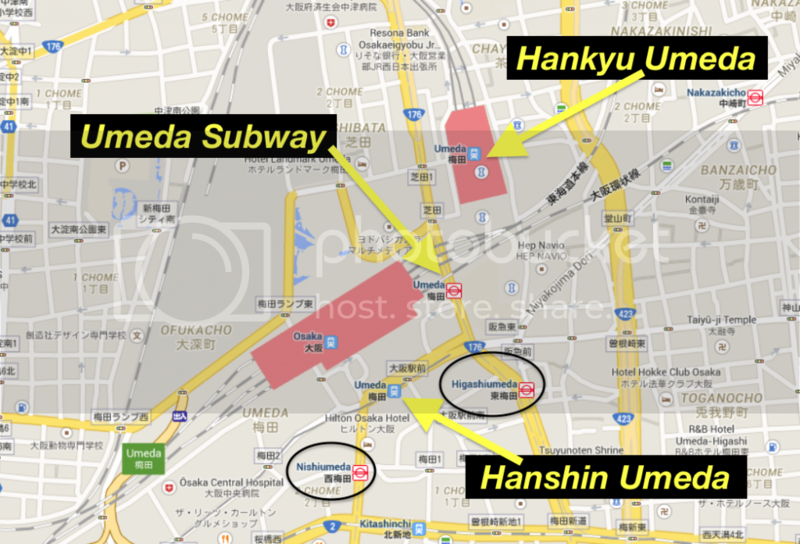 These are the stations closest to Sensoji Temple and Nakamise street. The Ginza subway line is useful for going between Asakusa/Ueno/Ginza/Shibuya. Tobu railways, on the other hand, is commonly used by visitors to Tokyo Skytree and Nikko further up north. The second option is the Asakusa station of Tsukuba Express line. This line terminates beside the huge Yodobashi store in Akihabara, and is not so convenient for accessing Sensoji Temple. The third option, Asakusabashi, is located a couple of blocks south of the Asakusa subway station. Not really that useful for going to Sensoji, unless transferring from the JR Sobu line. Sunset times will affect your sightseeing schedule since some sights are better seen in the day and some at night. Unlike in our tropical country, sunrise/sunset times in Japan vary with the seasons. In late autumn and winter, it starts to get dark from 3:30pm onwards. A useful site for checking this is timeanddate.com. Just enter "Japan" in the search box and click on the city you want to check. Be sure to pay attention to the winter/summer schedules of attractions. A few close earlier in winter. Tokyo sights are a mix of modern and traditional Japan. Aside from the Asakusa area, old structures are a rarity in Tokyo as the city has been largely rebuilt from the rubble of WWII. If you want to visit historical/old sites, add a day to visit Kamakura or Nikko. Or if grand old temples and shrines are really your thing, I suggest you extend your visit to include the ancient capitals Kyoto and Nara. The next section lists the top attractions in Tokyo for the average Pinoy visitor, with links to the japan guide article if available. For more efficient use of your valuable time in Tokyo, it is recommended to group adjacent sights in your itinerary. The list roughly follows the grouping in japan-guide.com. (guidebooks or other articles in the web might have slightly different groupings). Wont be posting photos here, just click on the links to read in more detail. Top Attractions in Tokyo grouped according to location. Average time indicated is just an estimate (not to be taken as hard fact). Ueno Park - Zoo, excellent museums, and a park (thats crowded in the hanami season) 3hrs-0.5 day. Odaiba - futuristic artificial island 3hrs-1 whole day, depending on the attractions youll visit, the most popular of which are Venus Fort, Toyota Mega Web, Panasonic, Miraikan, and Tokyo Big Sight. Tokyo Disneyland  no introduction needed. Link to official page/ticket prices. Sanrio Puroland  Hello Kittys own theme park located in Tama city, Tokyo. Access: by train to Keio Tama Center station. Ueno and Tama Zoo - Ueno Zoo is the centrally located zoo in Ueno Park. Tama Zoo, About 1 hour train ride from Shinjuku station (Shinjuku -> Takahatafudo -> Tamadobutsukoen). Tama Zoos enclosures are much bigger and the animals there look healthier than the ones at Ueno. For those with a day or two to spare, there are a handful of day trip opportunities within striking distance of Tokyo. Choosing your day trip will depend on your interests as well as your budget. View of Yokohama's Minatomirai district. Photo mine (rdvd). All rights reserved. Just 30 kilometers south of central Tokyo (the distance from Trinoma to Alabang), Yokohama is an easy half day or evening side trip from the capital. Most of Yokohamas sights are clustered around 2 areas: Minatomirai (literally, port of the future) and Chinatown. Make sure you dont get off at Yokohama station; continue instead to Minatomirai or Sakuragicho station, depending on which train line youre in (see How to get to Yokohama below). For those with a JR Pass or Kanto Area Pass: Bundling Yokohama on the way back from Kamakura or from Kansai is OK, otherwise dont waste your JR Pass/Kanto Area Pass with just a day trip to Yokohama from Tokyo. It is possible to walk from the Minatomirai area to Chinatown area (a 30 minute stroll). If youre too tired or its too cold/hot to walk, simply take the above mentioned train lines to your destination. One of the sightseeing boats at Lake Ashi. Photo mine (rdvd). All rights reserved. 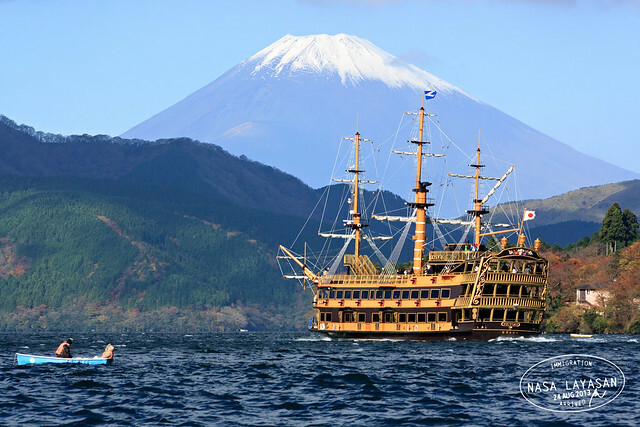 Arguably the most popular day trip from Tokyo, Hakone has volcanic attractions such as hot springs, views of Mt. Fuji (if youre lucky! ), and a smattering of different transportation modes that makes the journey as exciting as the destination. Good enough for a day trip, better if you decide to stay overnight at the many lodgings with hot springs. The Hakone Round Course  A popular way of visiting Hakone, the following route describes a counterclockwise path through the Hakone region. The reverse of this route (clockwise) can also be done, the advantage of which is an earlier arrival at Hakone-machi (better chances of seeing Mt. Fuji). The Odakyu Round Course map, photo credits to Odakyu official site. Owakudani  volcanic crater where visitors can buy and eat black eggs cooked in the bubbling pool. Detached Palace  former Imperial villa with good views across the lake and Mt. Fuji, weather permitting. Gotemba Premium Outlet  huge outlet mall on the outskirts of the Hakone region. Access is by Odakyu highway bus from Togendai or Gora stations. The best and cheapest way to see Hakone is by using the Odakyu Hakone Free Pass. The pass includes unlimited rides on all Odakyu-affiliated forms of transportation (Hakone Tozan train, Ropeway, Cable car, Lake Ashi sightseeing boats, buses) in the Hakone area without the hassle of paying for individual tickets. For tickets bought in Shinjuku, the pass includes 1 round trip by Odakyu Railways. - With a Kanto Area Pass  This pass will only cover train rides on the Tokaido Line (not the Tokaido shinkansen) from Tokyo to Odawara (and back). - Without any JR pass  The Hakone Free Pass from Shinjuku costs 5,140 for 2 days, but using the ticket in 1 day will still pay off if you do the whole Hakone round course in a day. Additional 870 yen (per person per way) is needed to ride the Romancecar (Odakyus ltd.exp. train with front-facing seats). Hakone: DIY or Guided Tour? It is possible to visit Hakone on a guided tour or on a do-it-yourself (DIY) trip. Guided tours are on the expensive side (12,000-18,000 yen per head) but these can bring you to Hakone AND Kawaguchiko in one day (albeit in a fast-paced trip). Combining Hakone and Kawaguchiko in 1 day will be near-impossible when going DIY. But going DIY will give you the flexibility of time, allowing stopovers as long as you like, and skipping those you dont fancy. In the end, its your decision. Hakone is a very popular day trip for tourists, local and foreigners alike, so its very unlikely youll get lost in Hakone as long as you stick to the well-traveled route. Gotemba and Hakone in a day? The Hakone round course (or its reverse direction) will take roughly one whole day including stops. Going to Gotemba outlet mall on the same day is almost impossible (if someone has done Hakone and Gotemba in a day kindly post a trip report). The best way is to stay overnight in Hakone to make full use of your 2-day pass. It pays to be flexible enough to shuffle your days in Tokyo and go to Hakone on the best possible day for a Mt. Fuji sighting. Check the following weather forecasts 1 week before, 2 days before, and the night before your intended date and adjust as needed. Mt. Fuji from Kachi-kachi observation deck. Photo mine (rdvd). All rights reserved. The Fuji Five Lakes region, Kawaguchiko in particular, is another popular side trip from Tokyo. It has stunning views of Mt. Fuji and its reflection on a lake (there are 5 to choose from, Lake Kawaguchiko being the most accessible). It is also popular in cherry blossom season where it is possible to view 2 symbols of Japan, Mt Fuji and the sakura, in a single vista. Mt. 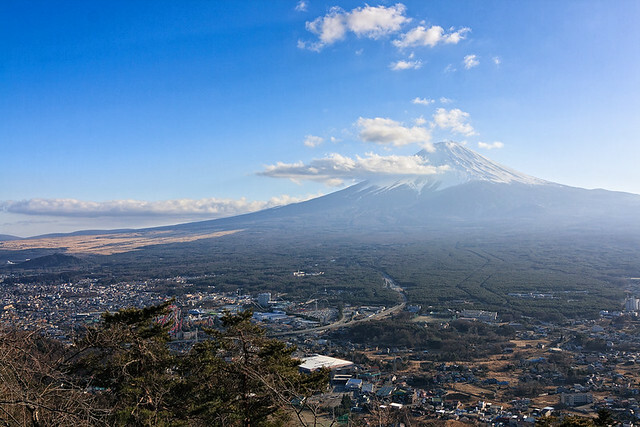 Fuji view  The famous mountain can be seen from Lake Kawaguchikos northern and eastern sides, and many other spots throughout the Five Lakes region. As in Hakone, winter mornings have a higher probability of clear weather. Chureito Pagoda  pagoda with breathtaking views of Mt. Fuji (weather permitting!) coupled with cherry blossoms in mid-April. Access: Shimo-Yoshida station on the Fujikyu Railway line. Mt. Tenjo Ropeway (Kachi Kachi Ropeway)  ascends 400m to the observation deck at Mt. Tenjo, with excellent views of Mt. Fuji and Lake Kawaguchiko. In unfavorable weather, just drop this to avoid disappointment. Kawaguchiko is one of the few main tourist areas of Japan that is more accessible by bus rather than train. The bus route from Shinjuku West exit is the most popular route and takes roughly 2 hours traffic-permitting, while the train route requires a change of trains at Otsuki Station from the JR Chuo line to the awfully slow Fujikyuko line which takes almost an hour to traverse the last 26.6 kilometers to Kawaguchiko (total train travel time from Shinjuku 2hr 5min). - With a JR Kanto area pass  By a special arrangement by JR East with Fujikyu Railway, the whole route from central Tokyo to Otsuki (all types of trains) and from Otsuki to Kawaguchiko (local trains only) is covered. A separate fee is needed to ride the Fujikyu Ltd. Exp. train but arrives in Kawaguchiko just a few minutes faster than the local train. - Without any JR pass  It is usually faster and cheaper to take a direct bus from Tokyo than 2 (or more, depending on your location in Tokyo) rides on the train. The jump-off point for Kawaguchiko is from the Shinjuku West Exit bus terminal. The one-way fare from Shinjuku costs 1,750 yen, and there are roughly 2 buses per hour. Check schedule and fares here. The Retro Bus goes around Lake Kawaguchiko from Kawaguchiko Station and stops at various sights along the way. The 2-day pass costs 1,030 yen. As with Hakone, your travel plans should be flexible enough to allow a visit to Kawaguchiko at the best possible time/day. Check the following weather forecasts 1 week before, 2 days before, and the night before your intended date and adjust as needed. On the day itself, the live view of Mt. Fuji from Lake Kawaguchiko can be seen here. But note that weather conditions quickly change. Odakyu Railways sells a 3-day rail-and-bus pass that makes it possible to enter Kawaguchiko by bus and exit via Hakone by Odakyu train (or the other way around), and includes unlimited rides on Odakyu-affiliated rides in the Hakone and Kawaguchiko areas. 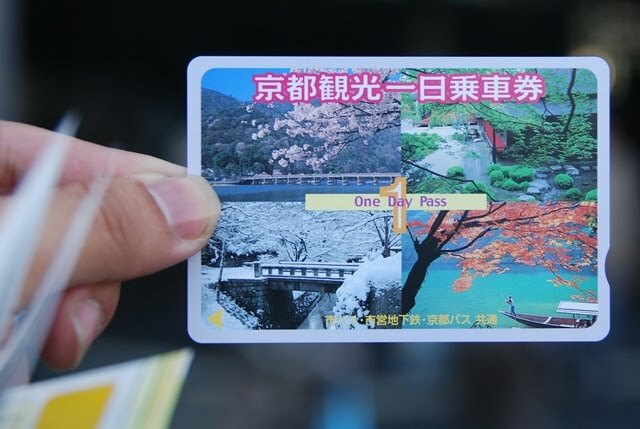 Think of it as an extended version of the Hakone Free Pass. Using this ticket, it is possible to go sightseeing in Kawaguchiko or Hakone on Day 1, end Day 1 by shopping at Gotemba (until 8pm, 7pm in winter), stay overnight at either Kawaguchiko or Hakone, and continue sightseeing on Day 2, and return in the evening to Shinjuku. Unlike the Hakone Free Pass, the Fuji Hakone Pass can only be bought at Odakyus Shinjuku Station. It cannot be bought at Odawara for those arriving from the Kansai area. Entry and exit point is only from/to Shinjuku. The Daibutsu at Kotokuin Temple. Photo mine (rdvd). All rights reserved. Famous for its giant bronze Buddha statue, as well as numerous temples and shrines. This side trip is recommended to those who are unable to include Kyoto in their itinerary due to time constraints. 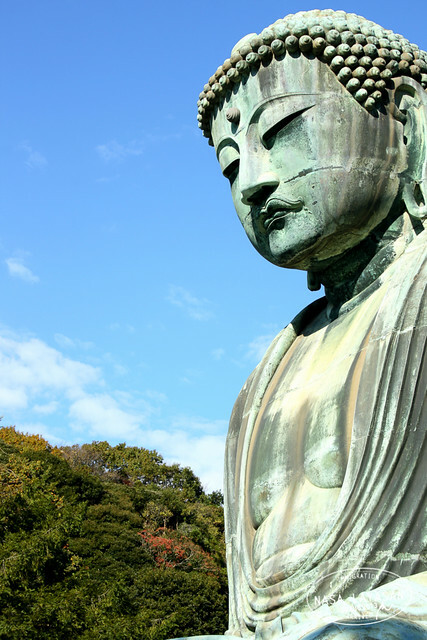 Kamakura can be visited in 1 whole day, or a very compressed half day combined with a stop at Yokohama in the latter half before returning to Tokyo. Same as 1-day itinerary above, minus Kita-Kamakura area. - With a JR Pass or JR Kanto Area Pass: If coming from Shinjuku or Shibuya, take a Shonan-Shinjuku Line train bound for Zushi. If coming from Tokyo or Shinagawa, take a Yokosuka Line train bound for Kurihama or Zushi. Get off at Kamakura or Kita-Kamakura station, depending on your itinerary. To go to the Great Buddha or Hasedera, just buy single tickets on the Enoden. - Without any JR pass: The cheapest way to Kamakura is by using the Enoshima-Kamakura Free Pass of Odakyu Railways. This includes a round trip from Shinjuku to Fujisawa, and unlimited rides on the Enoden and Odakyu lines between Fujisawa, Enoshima, and Kamakura, in a span of 1 day. Those staying on the eastern side of Tokyo will have to go to Shinjuku station to follow this route. Kamakura-Enoshima Pass (sold by JR)  Not worth the pass price (700). Odakyus Enoshima-Kamakura Free Pass is a better deal. Kamakura is small enough to be explored on foot. If you would rather take a train, the cute vintage Enoden trams connect Kamakura with Enoshima, passing by Hase station. Toshogus Yomeimon gate. Photo mine (rdvd). All rights reserved. Home to probably the most elaborately decorated mausoleum in all of Japan, and a few other natural and manmade attractions that will make you want to linger for another day or 2. Nikko is most spectacular (and most congested) in late October to early November when the mountainsides burst in autumn hues. The following are the major sights in Nikko grouped according to location. Note that these are spread throughout a large area, therefore it is impossible to see everything in 1 day. - With a JR Pass: Take the Tohoku shinkansen (Yamabiko/Nasuno/Tsubasa) from Tokyo/Ueno to Utsunomiya, then transfer to the JR Nikko line from Utsunomiya to Nikko. - With a JR Kanto area pass: Route for JR Pass users can be used. Another option is to take the Ltd.Exp. train from Shinjuku direct to Tobu-Nikko station. For both JR Pass and Kanto Area Pass users, you can either purchase a bus pass or just buy single tickets. ⬇ 17:36 or 17:39 last direct bus to Asakusa, if you miss this, you'll need to catch a local train and transfer at Shimo-Imaichi. The various train operators in Tokyo and the Kanto area sell numerous kinds of single and multi-day passes. The usual dilemma is how to determine which pass to purchase. Continue reading below to know which pass/es will pay off for your specific itinerary. Description: Virtually the same description, pros and cons as Suica, the only difference is it is sold by non-JR train companies like the Tokyo Subway operators (Tokyo Metro & Toei), Keio, Odakyu, Tokyu, etc. Great value ticket since a one-way Skyliner ticket already costs Y 2,470, which means you only pay 330 for 1-day unlimited subway rides (for the one-way + 1-day variant). For those with Tokyo-only itineraries, this ticket is recommended (buy the round trip variant). Just purchase individual tickets when going to Disneyland/sea. Tokyo Free Kippu coverage map. Credits to jreast.co.jp. Will only make sense if you plan on taking more than 6-8 JR/subway rides in a day, which is a lot! Will only make sense if you plan on taking 4 or more JR train rides in a day. Useful if you are staying near a JR station. You have to take any subway 5x or more to maximize this ticket. Useful if you are staying near a Tokyo Metro or Toei subway station. You have to take the Tokyo Metro subway 4x or more to maximize this ticket. Useful only if you are staying near a Tokyo Metro station. NOT VALID on Toei subway lines. An IC card (Suica/Pasmo) might end up cheaper than any of these tickets, especially if you plan your trips carefully and group sights by area. As shown above, the Tokunai pass wont pay off. The Tokyo Subway pass will pay off but is 33% more expensive than taking single fares on JR (for the exact same route). In this case it makes more sense to purchase the Tokunai over the Tokyo Subway pass, even if the total fares do not exceed the pass price. 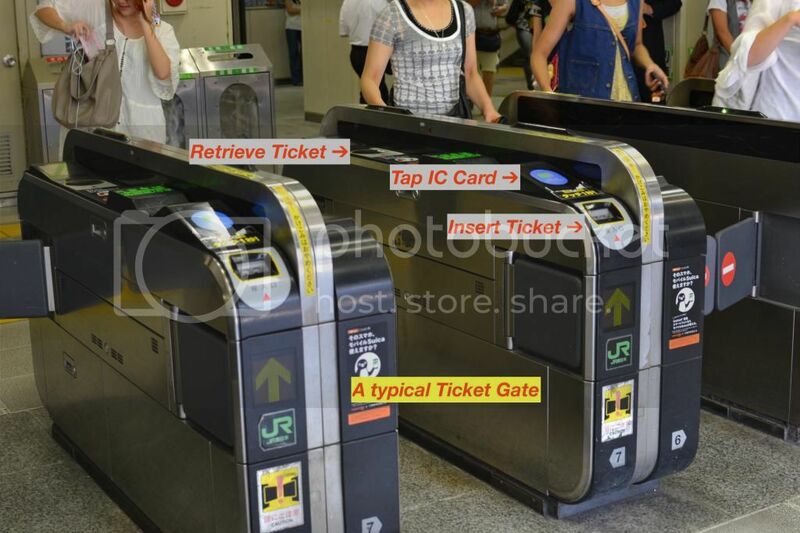 But if you want to be flexible and not be restricted to just the JR lines, simple use an IC Card (e.g. Suica/Pasmo) and tap-as-you-go. How to do fare comparison on your own? To show JR trains only, uncheck Private Railway from the SearchDetails menu. To show subways only, uncheck Japan Railway (JR). Valid on JR lines (incl. JR East shinkansen lines) and a few touristy non-JR lines in the Kanto region. Buy if you have a Tokyo-specific itinerary with 1 or 2 side trips to neighboring prefectures (e.g. Nikko or Kawaguchiko). Great if you can time the usage of this pass to coincide with either of your flight dates, taking the NEX to or from Narita Airport on the 1st or last day of the pass validity. 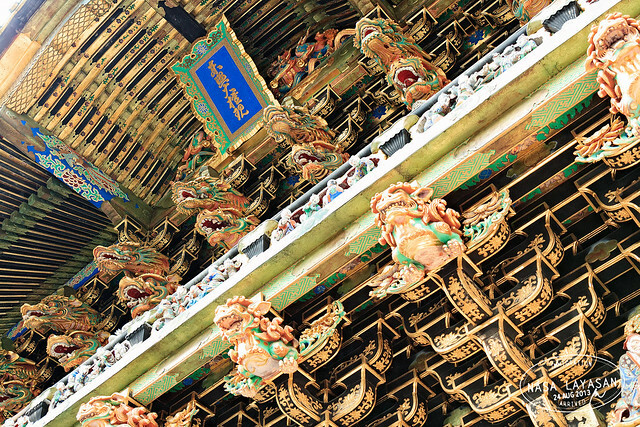 As seen above, the JR Kanto Area Pass pays off easily with just 1 or 2 side trips. For those with lots of extra days in Tokyo, 3 side trips on 3 days will really maximize this pass. Now that you have a general idea on the attractions in Tokyo and the surrounding prefectures, it's time to create your own itinerary. Most take the MNL-NRT flight of Cebu Pacific, arriving at 10:50 in Narita. This means youll arrive in central Tokyo around 1 or 2pm. I personally count this as Day 0, which means you can't fit a whole lot of stuff in the remainder of the day. On "day 0", it's best to include spots which are close enough to your accommodation. Concentrate on the must-sees in central Tokyo on days 1 and 2. Assuming your departure date is on day 3, substitute your personal must-sees with anything else (e.g. must see Disneysea over Imperial Palace etc). If you're staying for a 3rd and/or 4th full day, you can venture out of Tokyo and make a few side trips. A draft itinerary is shown below. We strongly recommend going through the entries for Tokyo and the Kanto Region in japan-guide.com. The Kansai Region is one of the nine regions that comprise Japan. Included in this region are the urban prefectures of Osaka and Kyoto, and the prefectures of Nara and Hyōgo. The latter is where we could see the cities of Kobe and Himeji. Osaka the city is the capital of the urban prefecture of Osaka. 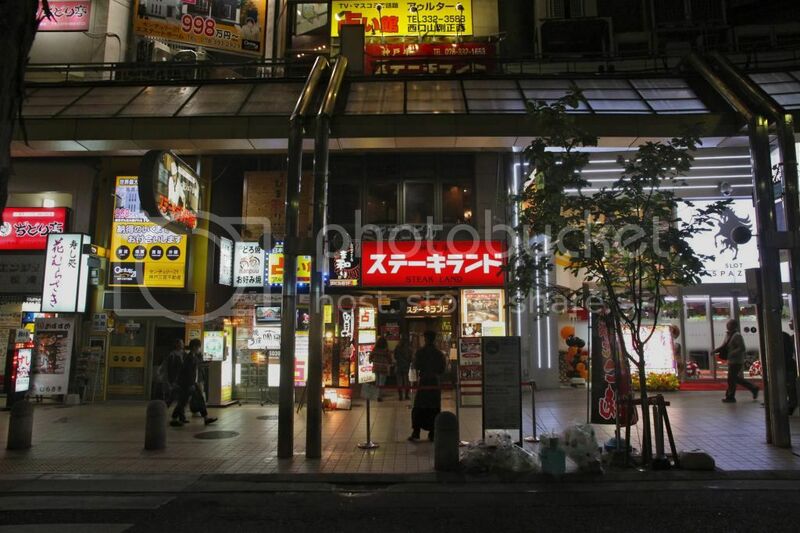 where many favorites of Japanese cuisine like okonomiyaki and takoyaki can be savored. Osaka prefecture is where Kansai International Airport is located, one of three ports of entry where flights that originate from our shores land. preparing an itinerary for Osaka. It is possible to get to Osaka by bus or train, or even by plane, from the cities of Tokyo and Nagoya. 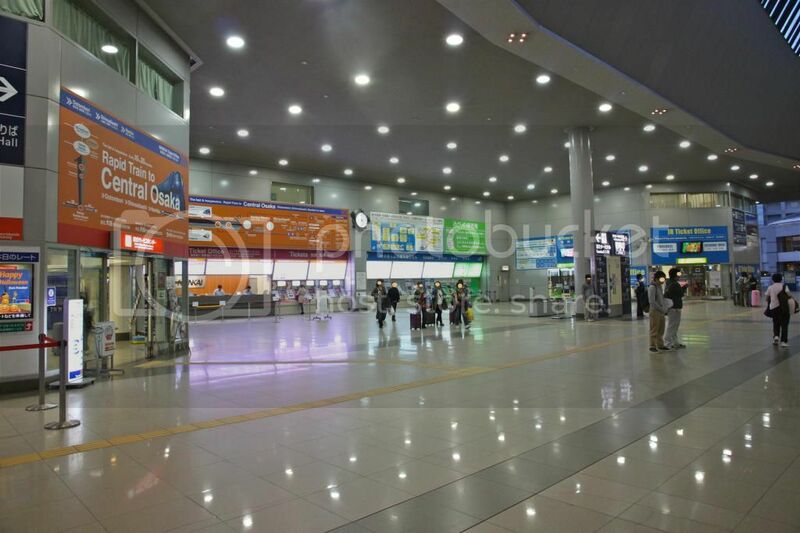 But for the purpose of this article, we will concentrate on how to fly in from the Philippines via Kansai International Airport. 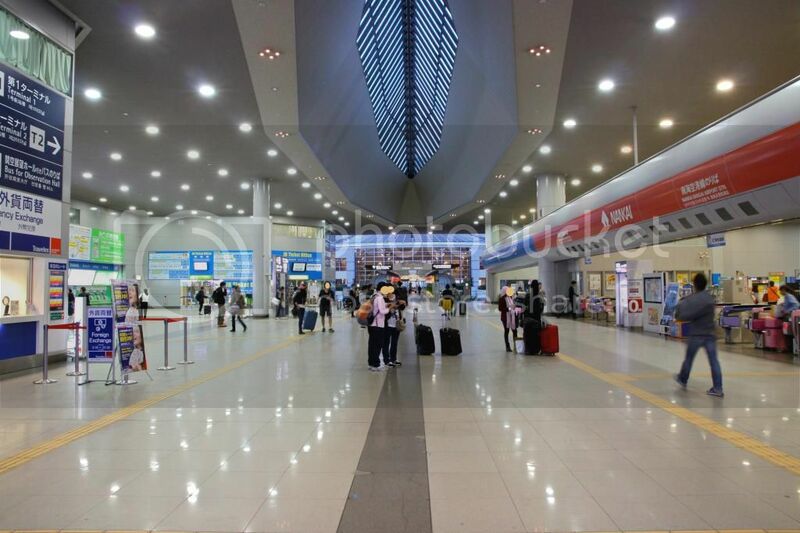 As previously mentioned, Kansai International Airport, or KIX for short, is one of three major entry points for airlines originating from Philippine airports. It services not only Osaka, but also most the Kansai region and beyond. This is a rehash of an old post I made at the old Osaka thread. It is meant to take the guesswork out of arriving at KIX. 3) what trains to take to get to your destination. Arrivals from either Philippine Airlines or Cebu Pacific often follow a path marked with signs to a light rail shuttle. This shuttle will transport passengers closer to the main building of terminal 1. After alighting the shuttle, you walk towards Immigration. Be sure to have your embarkation cards filled up and ready along with your passport. 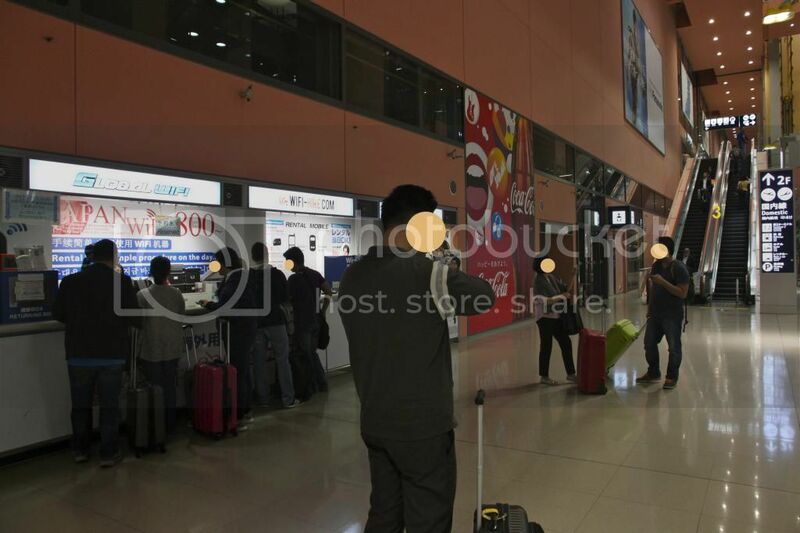 Once you've cleared immigration, you then go down to where the baggage carousels are, pick up your luggage and head to Customs which is right nearby. Once you clear Customs, you go through a sliding door to reach the first floor lobby of Kansai international airport's terminal one. Congratulations! You are officially in japan! *don't ask me where the domestic departures go. This illustration gives you a rough idea of the layout of the first floor lobby. 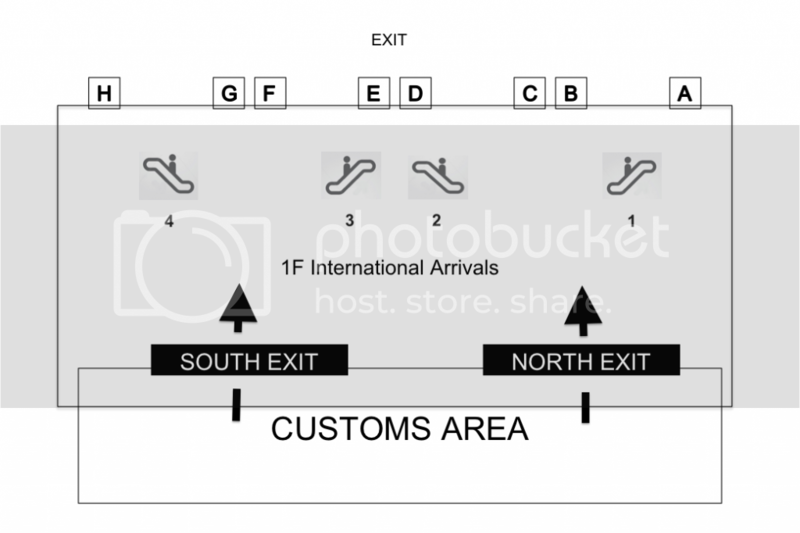 As you can see in the illustration above, you pass through either the North or South exits once you are done with customs. Here is a picture of what you will see once you exit the South exit. *note the escalator labeled 4 and the exit labeled G and correlate with the illustration on top. The bus stop for the bus to the Osaka City Air Terminal (OCAT) near the JR Namba Station, is located on the street just outside the airport. wait for the bus to come, and board it. 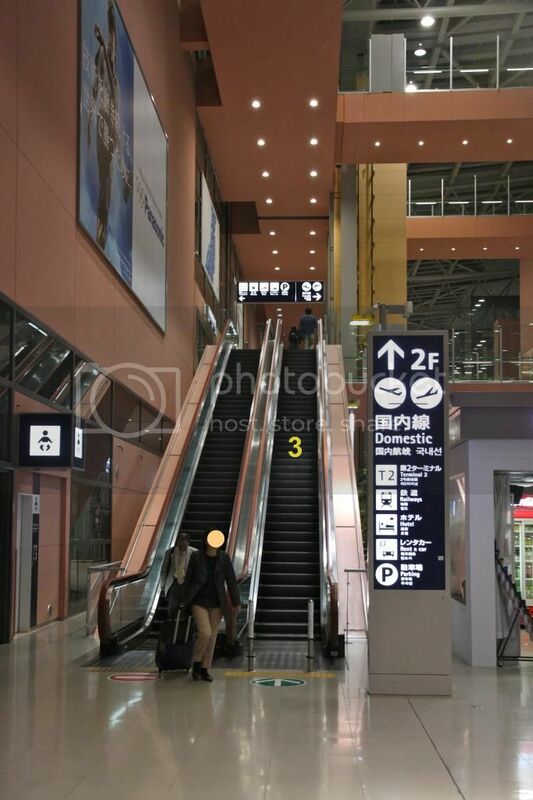 After exiting to the lobby, you need to locate escalators 2 and 3 to get to the train stations. If you pass through the south exit pictured above, that will mean turning right as you walk further into the lobby towards Exit G.
As you turn right, you will eventually see escalator 3. Note that the escalators arent really marked with nos. It was only I who chose to identify them with numbers. The exits on the other hand really are marked with letters as can be seen in the picture above. Get on either escalators 2 or 3 to get to the 2nd floor. Exit through either Exits D or E of the 2nd floor (immediately to the left at the top of escalator 3; right when using escalator 2). Once you have exited the building, you will see 2 walkways that cross the street below. Note man on the left walkway headed away from the airport terminal 1 building. Cross the walkway to get to the parking building which also houses the train stations (1st and 2nd floors). This is how the lobby of the train station will look like as you cross either of the walkways. There are 2 railway companies that service Kansai International Airport- Japan Railways (JR) and Nankai Railways. and the ticket office again for both JR (blue with yellow "JR Ticket office" written) and Nakai (red under the orange sign) on your left. Both train companies that service the Kansai International Airport have 3 general kinds of trains, a faster Ltd Express, a median Rapid train, and a slower Local train. For JR, the Ltd Express is also known as the Haruka ltd express. For Nakai, it is the rap:t ltd express. What train should you take will depend on what area or near what area will you be staying in. (eg. when i list the JR Haruka ltd express, that means that to me is the best option; you can however take a slower and cheaper jr train instead). Those who need to pick up their ordered pocket wi-fi at KIX can do so right before going up escalator 3. P.P.S. There are money changers at both the first and fourth floors (at least, that's what I have observed). In the chance that you plane in to Tokyo or Nagoya from the Philippines and want to visit Osaka, you have the option to get here by either train or bus. By train, we often correlate it to mean the Shinkansen; and by bus, we often correlate it with the overnight bus run by the Willer Express bus company. Traveling by Willer Express bus at night is way cheaper than traveling by Shinkansen. Not only are the fares cheaper, but you also save on one nights accommodation since you will be traveling at night. But therein lies the counterpoint against the overnight bus. First, you have to busy yourself all night, with your luggage at that, while waiting for the bus to depart, which typically is close to midnight. And second, sleeping on a bus could get quite uncomfortable. Traveling by Shinkansen on the other hand is a relatively more comfortable experience. The seats are spacious and, if you travel with the sun out, the views could be rewarding. Mt. Fuji on a clear day anyone? Both options have arguments going for and against them. Ultimately, you decide between comfort and savings. With the Shinkansen, you arrive at Shin-Osaka station. 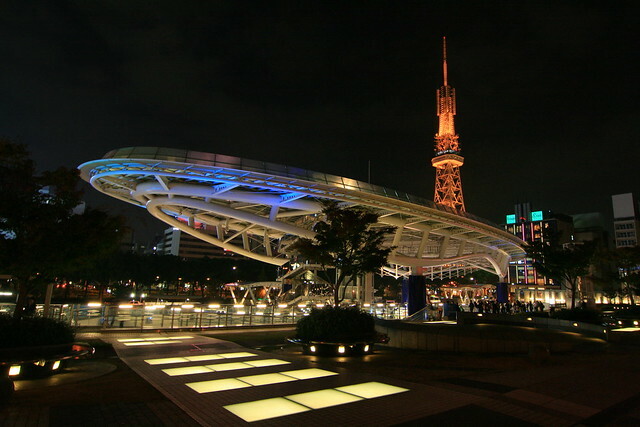 Willer Express terminal is at the East Tower of the Umeda Sky Building. It has numerous bus stops throughout Osaka which are listed here. You will be spoilt for choice deciding where to stay. you will find it in Osaka. 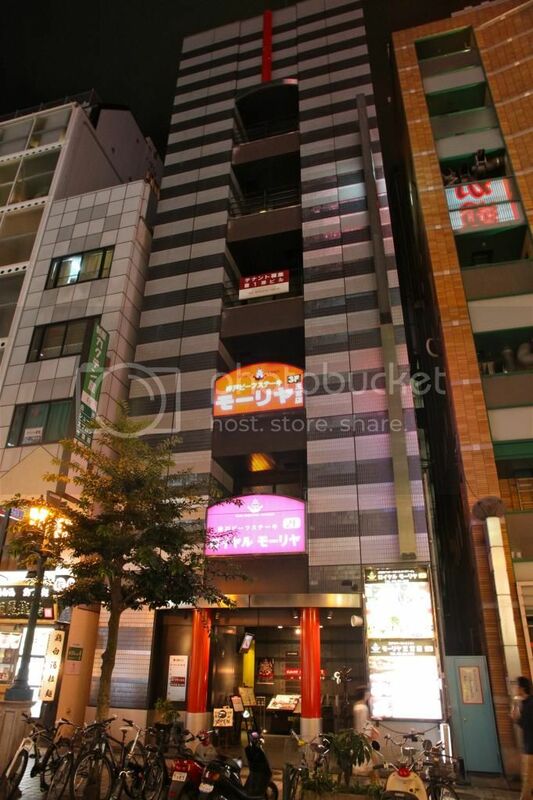 Many members have shared where they have stayed while on holiday in Osaka. I have listed below the more recent shares and have grouped them according to their price point. Prices reflect actual reported prices or lowest published web rate for a double room. Many people that have come across the old threads ask, "In what area of Osaka is it best to stay in?" Budgetary constraints aside, the answer always depends on what interests you, the traveller. Do you want to be in the center of it all? Do you want a little peace and quiet? Do you want to be near a specific place that is the reason for your travel like, Universal Studios Japan perhaps? The thing is, there will be options for accommodations in almost any part of the city. It will just depend on where do you want to be in. Useful if you want to explore the Kansai region via shinkansen. Osakas own Castle is a must-see destination especially when you are not scheduled to visit any other castle on your holiday. 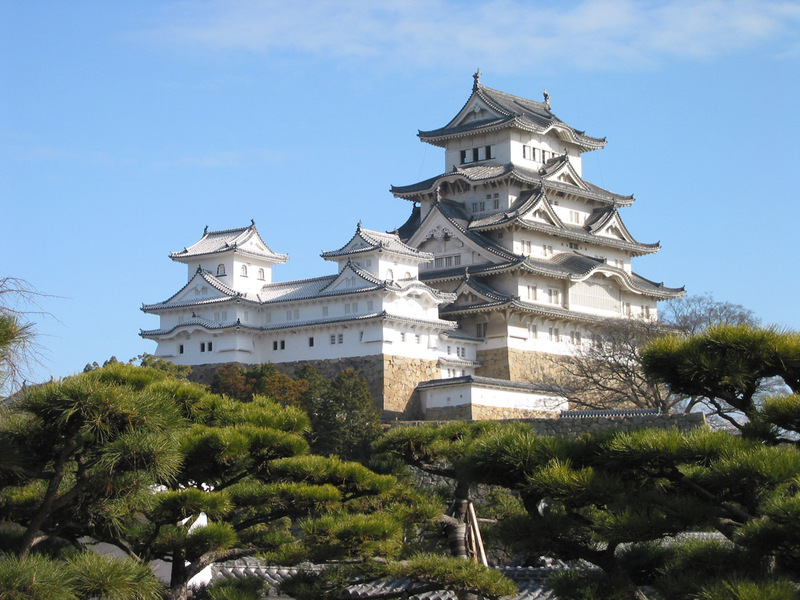 Even if you are scheduled to visit, say, Himeji Castle, a trip to Osaka Castle might prove worthwhile. Todays castle is not the original castle. That was destroyed several times over the years. What you see today is a faithful reproduction of that original castle and, at first sight, is both beautiful and imposing. It gives its visitors an example of classic Japanese architecture and distinguishes itself from its modern surroundings. Surrounding the castle are moats and the vast Nishinomaru Garden. The garden is a favorite spot for Hanami viewing and requires a fee to enter. Viewing the castle from the outside is free. Expect to pay a fee if you want to enter the castle. Image from japan-guide.com; credits to them. A fellow member who visited Osaka recently posted a picture showing numerous trees in its fall-colored splendor. Take the Nagahori Tsurumi-ryokuchi subway line and get off at Osaka Business Park station (N21). such as takoyaki and okonomiyaki; and Japanese cuisine, like ramen. from clothes, shoes, souvenirs, Hello Kitty paraphernalia and, even more food. Shinsaibashi and Dotonbori run perpendicular to one another. Somewhat between these two streets is a canal that is parallel to Dotonbori. Located along its banks are numerous neon signs (now LED) that this area is famous for; none more famous than the Glico Running Man. The canals banks also play host to cosplay gatherings. When done sightseeing, you can shop for pasalubong at Don Quijote or Donki for short; which is also located on the bank of the canal. Best way is to get on the Midosuji subway line and get of at either Namba station (subway) (M20) or Shinsaibashi station (M19). Alternatively, you can get on the Hanshin Namba line and get off at its penultimate stop, the Osaka Namba station. Or, take the Nankai Main line and get off at its penultimate stop at (Nankai) Namba station. Ill admit, even if Universal Studios amusement park isnt something you should sneer at, it likewise is something you could easily ignore. That said, it hardly is a place anybody should include in their must see list. Enter The Wizarding World of Harry Potter (WWOHP) and all that changes. You suddenly have an amusement park worthy of a must see label. A trip to WWOHP will bring out the child in you. Seeing the façade of the Hogwarts School of Magic is enough to illicit wonderment. and youve got an attraction that you wont regret spending a day in. *from the Harry Potter Facebook page; credits to owner. How to get here: Take the JR Yumaseki line from Nishikujo station to Universal City station. Buy your park tickets at the ticket offices by the gate. You can likewise buy them at Lawson, a local convenience store (Konbini). You cannot buy tickets online. While it was once reported by a member in the old Osaka thread that a local travel agency- H.I.S. Travel in Serendra, sells tickets, this hasn't been confirmed. I don't recall anyone actually stating that they indeed bought one themselves (first hand experience) at the popular konbini. In an attempt to manage the crowds going to WWOHP, USJ issues Timed Entry Tickets specifically for this area and this area alone. It is a free ticket that you get near the entry gate of WWOHP. It indicates the time you will be allowed entry inside the WWOHP. Limited Time entry Tickets are issued for a specific time frame (eg. 10:00am - 12:00nn, 4:00 - 6:00pm) and they may run out. If you weren't able to get inside the grounds of WWOHP as the gate opens, be sure to get a Timed Entry Ticket as soon as you can. Tall building in the Umeda (Kita) District that has a 'floating' garden on top where nice views of the city can be had. Expect to pay an entrance fee. How to get here: Get to either Osaka or Umeda Stations and walk approximately 15 mins north east. Known for a big, central tank that features a Whale Shark among others. How to get here: Take the Chuo subway line to Osakako Station. One of the older temples in Japan. Popular shrine located near Tenjinbashisuji shopping street, Osaka's longest. The Osaka Museum of Housing and Living, dedicated to give visitors a glimpse of old Osakan houses and neighborhoods, is located along the shopping street. How to get here: Take the Tanimachi or Sakaisuji subway lines to Minamimorimachi Station or the JR Tozai Line to the Osakatemmangu station. Displays depicting important milestones in Osaka's history. Located near the castle grounds. How to get here: Same as how to get to Osaka Castle. The museum is a 2 min walk north of exit 9 of the Tanimachi 4-chome station. Osaka's answer to the Eiffel Tower. Located in the Shinsekai area, known as one of the seedier areas of Osaka. How to get here: Multiple lines to any of the ff. stations: Shinimamiya, Dobutsuenmae or Ebisucho. Photo by member rgie33; credits to her. ..along with other famous Japanese dishes like Ramen, Tempura and Sushi. For suggestions on where to find these delicacies, kindly read post #158here, and post #162 here. Osaka is covered by a web of subway and train lines, supplemented with taxis and an equally dense bus route; making nearly any point in the city easily accessible. The city has 2 main centers, Umeda in the north, and Namba in the South. making this subway line a vital transportation cog. Another vital transportation cog is the JR Osaka Loop line. This line goes around the fringe of the city proper and counts Tennoji and Osaka stations as stops. Both are major stations where you can connect to numerous other lines. The loop line also stops at Nishikujo station where you can transfer to the JR Yumesaki line to get to Universal Studios Japan. The JR Hanwa/Airport line and the Nankai Main line as they connect the city, via Tennoji/Osaka/Shin-Osaka stations and Namba station respectively, to Kansai International airport. The Kyoto line of both JR and Hankyu Rail, which connects Osaka/Shin-Osaka stations and Umeda station respectively, to Kyoto station. The Hanshin Namba and Main lines and the JR Kobe line that connect Osaka-Namba, Hanshin Osaka and Osaka stations respectively, to Sannomiya and Kobe-Sannomiya stations in Kobe. The JR Yamatoji line and the Kintetsu Nara line that connect Tennoji and Osaka-Namba stations respectively to Nara and Kintetsu Nara stations in Nara. The southern city center of Osaka is popularly known as Namba. It is the citys entertainment hub and the number of transportation companies converging in this area makes this apparent. 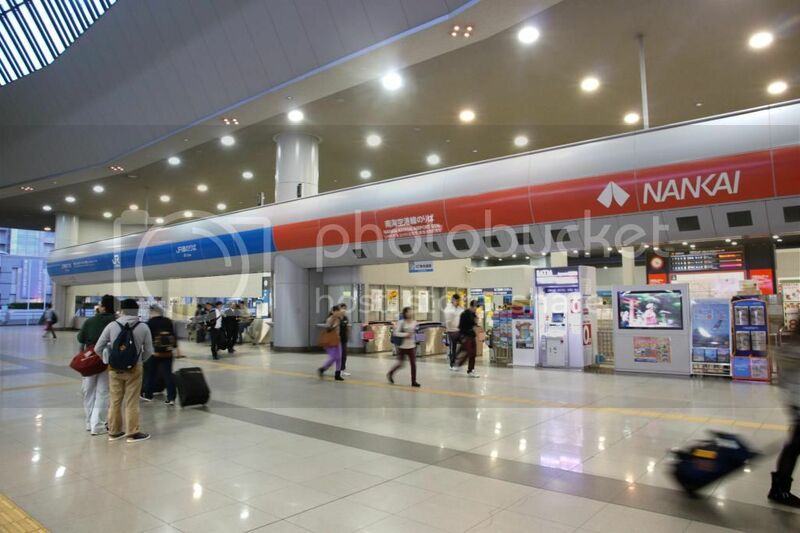 It is serviced by 4 train companies via 3 stations invariably called Namba Station. For a first time visitor to Namba, all this can be confusing. Good thing we could set things straight and set the confusion aside. The 4 train companies that have stops here are Japan Rail, Nankai Rail, Hanshin Rail, and Kintetsu Rail. They all stop at a Namba station.' 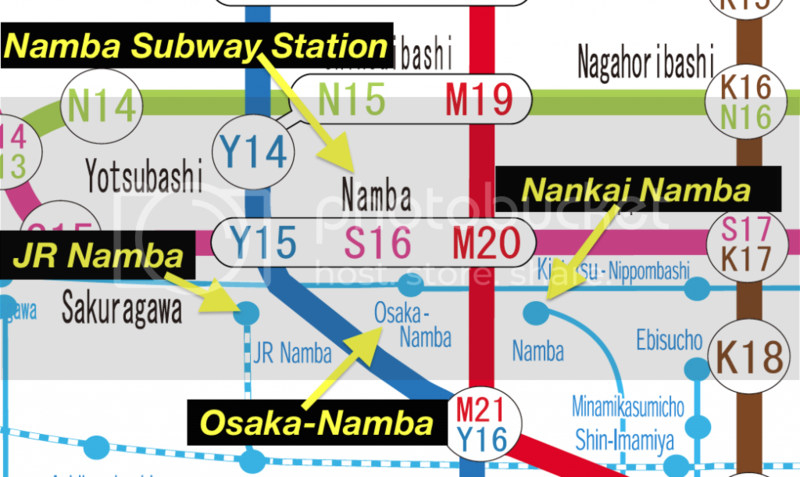 However, if you look closely, those Namba stations are easily identifiable. 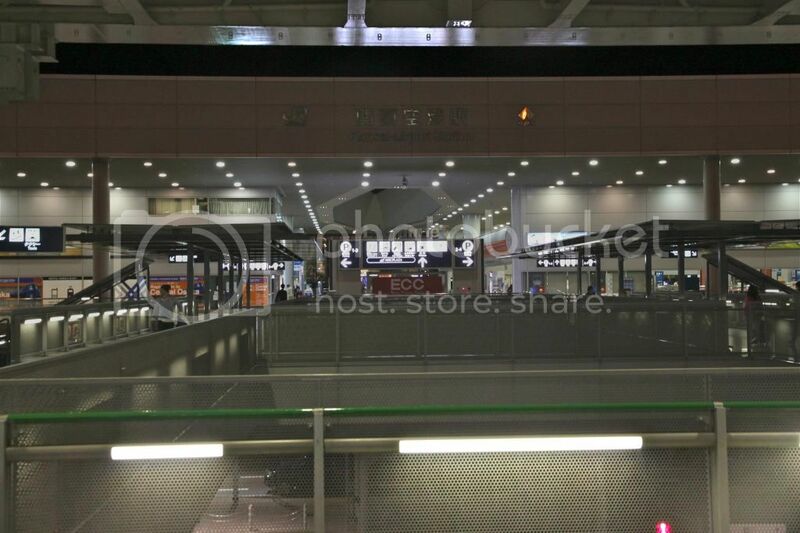 As you can see, Hanshin and Kintetsu Rail Companies share a station in Namba. all stop at Namba Subway Station. I hope that clears some of the confusion regarding Namba station (till you get to Namba Walks). Hyperdia will be so pleased. LOL. HOW MANY UMEDA STATIONS ARE THERE? If Namba is the southern city center of Osaka, Umeda is its northern city center. As such, the same confluence of transport companies you see in Namba, you see even more in Umeda, being the busier of the 2 hubs. Aside from JR, this confluence brings about 2 other rail companies and 3 subway lines to stop at stations in the area named Umeda. 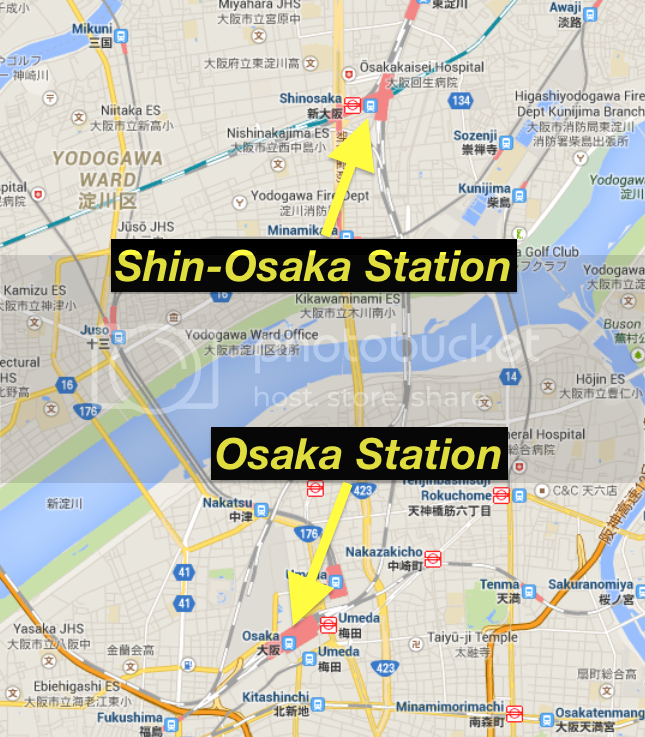 OSAKA STATION and SHIN-OSAKA STATION: WHAT'S THE DIFFERENCE? Another transport company with a presence in Umeda is the ever visible Japan Rail (JR). Instead, they went with the unique name OSAKA STATION. LOL. While it is hard to confuse Osaka station with all the surrounding Umeda stations, some people confuse it with its distant northern neighbor, SHIN-OSAKA STATION. For most travellers, getting an Icoca IC card is all they'll ever need. Partner this with a Haruka Ltd. Exp. ticket, particularly when purchasing a Icoca & Haruka package, when traveling to Tenoji, Shin-Osaka or Kyoto, and you're all set. However, for a select few, getting a pass could prove beneficial in defraying cost of transportation. There are a few rail passes in Osaka in particular, and in the Kansai region in general, that could be useful for travelers to this part of Japan. Surutto Kansai Pass - buy if you plan to do some heavy train travel out of Osaka. Japan West Rail (JR West) Pass - comes in different iterations based on no. of days it's valid. - consider the one-day pass (¥2,300) when traveling to Himeji (one-way fare is ~¥1,500). JR Pass - ¥29,110 (7-day pass); consider only if you will travel to Tokyo and back. Do a tour of the city. Go to Osaka Castle in the morning. Shop and eat at the Dotonbori/Shinsaibashi corridor later in the afternoon. In between, you can go to any of the 'nice to see' sights listed above like the Kaiyukan/Osaka Aquarium, the Tenmangu shrine and/or the Umeda Sky Building. Go to Universal Studios Japan on the 2nd day. Love shopping? Take a 40 min. train ride south to Izumisano and spend the day shopping for bargains at Rinku Outlet Mall. Outlet shopping not your thing? or go to Namba to shop at Takashimaya and Namba Parks. The other urban prefecture in the Kansai region (the other being Osaka), Kyoto is arguably the 2nd most popular destination in all of Japan. The main reason for this is the wealth of old structures that still stand in the city today, giving its visitors a glimpse of old Japan. tips on making an itinerary for Kyoto. Filipinos do not go directly to Kyoto from the Philippines. Rather, they go here by train or bus from the three ports of entry available to them: Tokyo, Osaka and Nagoya. From Tokyo, the popular choices for travel to Kyoto are the shinkansen during the day time, and the Willer Express sleeper bus at night. Travel time via shinkansen is 2 hrs. 40 mins. Meanwhile, the sleeper bus takes more than 7 hours to travel the same distance. Several buses leave Tokyo between 10:00 pm to midnight and arrive in Kyoto at six-ish in the morning. Aside from the shinkansen, other slower, cheaper trains can be boarded to get to Kyoto from Tokyo. You can even board a day bus. But due to the long distance between the two cities, these are not popular choices. It will be a waste of time getting stuck on a train or a day bus that long. Osaka and Nagoya on the other hand are near enough, making travel to Kyoto via a bus or a train other than a shinkansen a good alternative. This close proximity is also the reason why traveling by bus either at night time or day time isnt a popular choice. The regular trains are faster and just as cheap. However, it is hard to beat the experience of getting to travel by shinkansen; not to mention, it is the fastest, too. Here is a table depicting the times it takes to travel to Kyoto from Nagoya and Osaka. ☞ If coming from Nagoya, travel by JR and Kintetsu rail. ☞ Use JR, Hankyu Rail or Keihan Rail if coming from Osaka. Kyoto offers a lot of attractions and all of these cannot be seen in one day. nothing beats staying in Kyoto for a night or two or more. Again, several members who have passed through the old Japan and Osaka threads have shared where were they booked while on holiday in Kyoto. Areas that are ideal to base yourself in Kyoto are the Karawamachi/Gion area and the area surrounding the Kyoto station. basing yourself near Kyoto station affords you easy access to neighboring Osaka and Nara. Kyoto is filled with temples and shrines. and youve got a Japan holiday seekers dream destination. Photo taken from Christian Jentsch's Flickr page. Photo credits to him. 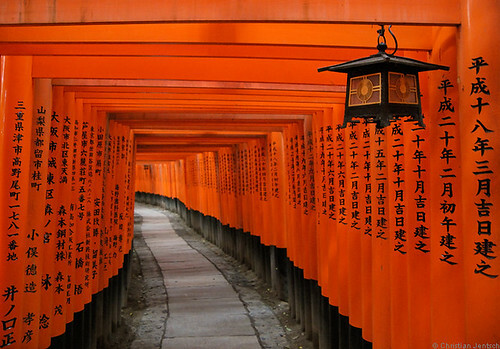 known for the thousand vermillion-colored torii gates present within its site. How to get here: Take either the JR Nara line to Inari station or the Keihan Main line to Fushimi Inari station. known for its pavilion that is covered in gold leaf. How to get here: Take bus nos. 101 or 205 from either Kyoto station or KItaoji station of the Karasuma subway line. Image taken from the suete.ro web page. Photo credits to them. There are numerous sights that you can visit in Arashiyama but this by far, is the most famous. The bamboo grove is known for its, well, tall bamboo. How to get here: By Randen (Keifuku) tram, the JR Sagano line or the Hankyu Arashiyama line. You can also take bus nos. 11 or 93. Image taken from wallpaper.free-photograph.net. Photo credits to them. where traditional wooden shops/houses abound; famous as a Geisha-spotting area in the late afternoon to early evening. How to get here: Walk 5-10 mins. east from Kawaramachi station (Hankyu Kyoto Line) or 5 mins. east from Keihan Rails Gion-shijo station. Alternatively, you can take several buses to get to the Gion bus stop, like: 12, 46, 100, 201, 202, 203, 206 or 207. Photo taken from youinjapan.net. Photo credits to them. old castle surrounded by walls and a moat. How to get here: Take the Tozai line to Nijojo-mae station or take bus no. 9, 12, 50 or 101 to the Nijojo-mae bus stop. Photo from gadling.com. Credits to them. very old temple with a spacious, wooden balcony. How to get here: Take bus no. 100, 202, 206 or 207 to the Kiyomizu-michi bus stop and walk up through the Higashiyama District. GINKAKUJI TEMPLE: Converted temple with a sand garden as well as a Japanese garden. ☞How to get here: Take bus no. 5 or 100, among others. NANZENJI TEMPLE: Temple with a Roman aqueduct within its grounds. ☞How to get here: Bus no. 5 and 100 takes one closest to the temples entrance. NISHIKI MARKET: Covered market in selling dry and wet goods. ☞How to get here: Take the Hankyu Kyoto line to either Karasuma or Kawaramachi stations. Alternatively, take the Karasuma subway line and get off at Shijo-Karasuma station. RYOANJI TEMPLE: Temple with famous rock garden. And no, there is no singing with electric guitars. 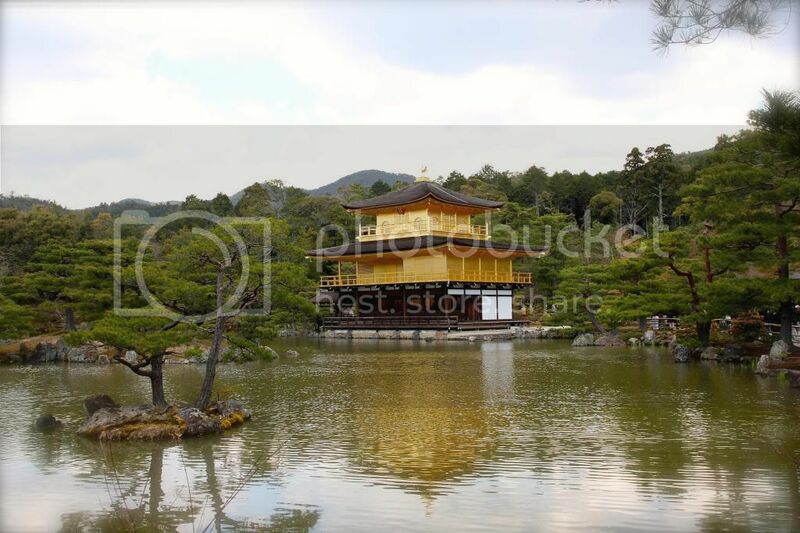 ☞How to get here: Take bus 12 or 59 from Kinkakuji temple. TOGETSUKYO BRIDGE: Another popular landmark in the district of Arashiyama. Pretty during hanami and koyo viewing season. ☞How to get here: see Arashiyama Bamboo Grove. TOFUKUJI TEMPLE: Temple with garden famous for its fall foliage. A good destination during late November. ☞How to get here: Get off at Kofukuji station on either the JR Nara line or the Keihan Main line. Bear in mind that these are not the only places that you can visit in Kyoto. For a more complete list, proceed to japan-guide.coms Kyoto page. Just like other big cities in Japan, a busy network of train and subway lines serves Kyoto. Unlike the rest of Japan however, it has a bus network that is even more extensive than its train and subway network. ☞ Arashiyama is served by 3 rail lines: JRs Sagano line, Hankyus Arashiyama line and Randens tram line. the Keihan Main line in the EAST; useful when going to Ginkakuji temple, Nanzenji temple, the Gion area, Kofukuji temple and, Fushimi Inari shrine. ☞ The east to west axis on the other hand is served by the Tozai subway line right down the middle of Kyoto and is useful when getting to Nijo castle, the Gion-potoncho area, and Nanzenji temple. ☞ Lastly, JR, through its Kyoto line and Nara line, connects Kyoto station with the cities of Osaka and Nara, respectively. As mentioned earlier, Kyoto is unique in that its bus system not only rivals its train and subway system but, even surpasses it in terms of density. This density arises in part from the confluence of both city-run buses and those run by private companies. Image from Kyoto City Web website. Credits to them. Kyoto has 3 buses that are primed for tourists, the so-called Raku buses. Bus No. 100 departs from Kyoto station and its route travels through eastern Kyoto. It passes by the ff., among others: Kiyomizudera temple, Nanzenji temple and Ginkakuji temple. Bus No. 101 also departs from Kyoto station and makes its way up the middle of Kyoto to the northern parts of the city. 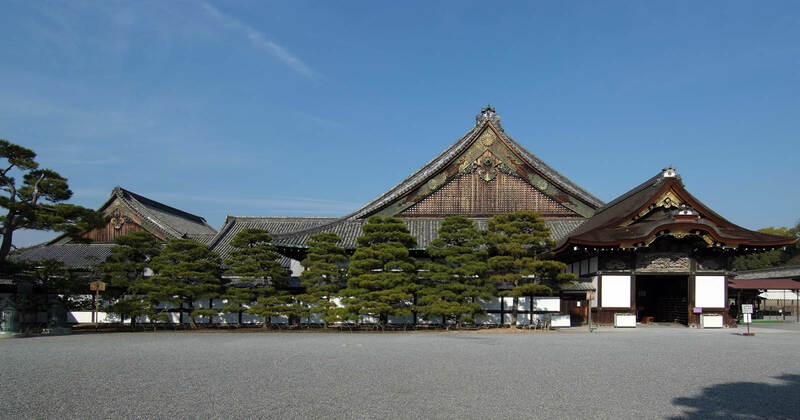 It is useful in getting to the ff., among others: Nijo castle, Kinkakuji temple, and partly to Ryoanji temple. Bus No. 102 doesnt depart from Kyoto station. It is confined to the northern part of Kyoto and runs on an east to west loop. It connects Kinkakuji and Ginkakuji temples and stops near the Imperial Palace along the way. :confined to the inner city and fare is a standard ¥230. Many of the major transportation conglomerates like Japan Rail (JR), Hankyu Rail and Keihan Railways also run bus lines in Kyoto. A example of a private bus that is of interest to tourists is the hop-on, hop-off (HOHO) Bus. Known as the Kyoto World Heritage Tour Bus, this hop-on, hop-off bus has its benefits and its misgivings. More information on the Kyoto World Heritage Tour Bus can be read here. There used to be a time (as early as a month ago) when the only way you can pay for your bus fare was either thru cash or bus pass. 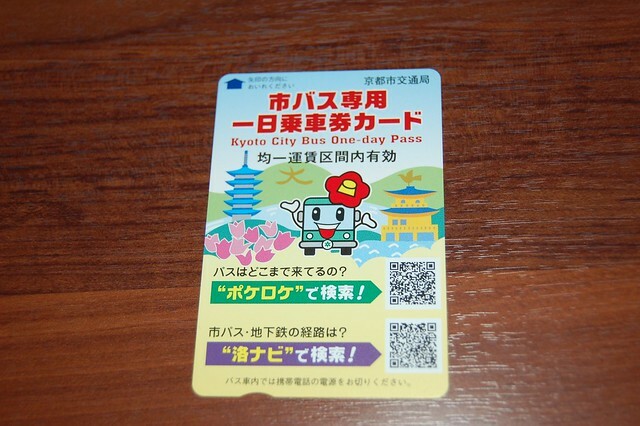 Recently however, Kyoto's city bus have been upgraded to accept payment by tapping your IC card. Here now are the steps on how to pay for your bus fare. Enter the bus by the middle door and pay the 'flat rate' of ¥230.00 at the bin beside the driver as you exit the front door. Enter the middle door and take a numbered ticket from the dispenser beside the entry door. As your destination approaches, look at the display in front of the bus and take note of the fare written beside the no. that matches that of your ticket. Pay the corresponding fare in the bin beside the driver as you exit via the front door. Photo from insidekyoto.com. Credits to them. Photo from backpackboy.com. Credits to them. You can visit Kyoto in a day. Ideally though, you should earmark 2-3 days to be able to see most of what Kyoto has to offer. Start early and choose 4 sights that pique your interest the most. See 2 of them in the morning, and the other 2 in the afternoon. Try to arrange the order in which you will go to them according to their proximity to each other, keeping transport options between these sights in mind. You should also bear in mind the opening and closing times of these sights when planning your day. For example, I have listed down the six most popular sights in Kyoto based on inquiries made at the old Japan and Osaka threads. Starting point is Kyoto station. The Northeast Zone includes Ginkakuji Temple ➔ Philosopher's Path ➔ Nanzenji Temple. The Southeast Zone primarily includes Yasaka Shrine ➔ Higashiyama Preserved District ➔ Kiyumizudera Temple. The Central Zone includes Nijo Castle, the Kyoto Imperial Palace, Nishiki Market and the Gion District. Arashiyama could be counted as a zone on its own; sights here include Togetsukyo Bridge ➔ Tenryuji Temple ➔ Bamboo Grove. Not a zone but, you can add to these Kinkakuji Temple in the north and Fushimi Inari Shrine in the south. Now, assign one zone for the morning and another for the afternoon and, you get to see 2 zones in a day. So for 2 full days in Kyoto, you can possible tackle (depending on how fast or slow you walk) 4 of the 5 zones listed above. Nara, Himeji and Kobe are favorite side-trip destinations from Osaka or Kyoto. Looking at the map above, you will find that their proximity to one another is one reason for this. Japan's terrific public transportation is another. From Osaka or Kyoto, you can schedule a half day jaunt to Nara. Schedule a whole day if you go west to Himeji and Kobe instead. 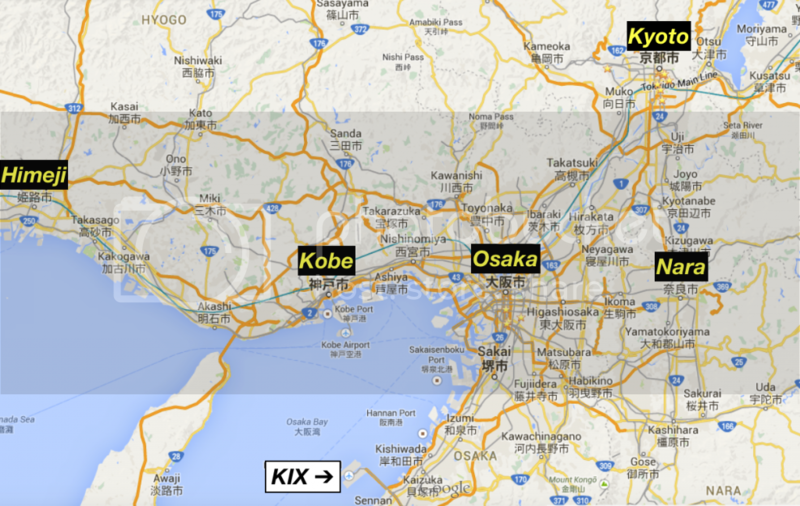 Yes, you can fit in both Himeji and Kobe in a day in that order. You however cannot schedule Nara and either Kobe or Himeji in one day. Alright, maybe you CAN successfully attempt to visit Nara and Kobe in one day. Nara and Himeji on the other hand might end up in disaster. And you can definitely forget about going to all three. An alternative to a one-day trip to both Nara and Kobe will be to go to Nara in the morning, then spend the afternoon in your base city, whether it be Osaka or Kyoto. You then go to Kobe the afternoon of the next day after spending the morning touring your base city. A favorite side-trip destination from Osaka or Kyoto, Nara is a welcome change of pace compared to its more fast-paced neighbors. how to schedule an itinerary for Nara. As mentioned earlier, Nara is a favorite side-trip destination from Osaka and Kyoto. It is commonly reached from these cities by train. Two rail companies serve Nara. They are Japan Rail (JR) and Kintetsu Rail. Both these rail companies travel to and from Osaka and Kyoto. JRs Nara station is located at the west end of the city center. Kintetsus Nara station on the other hand is more centrally located and is just a few steps away from Nara Park. There are a number of mainly business hotels in Nara but, none have so far been reported as been having stayed at by PEX members. meaning, people who go to Nara tend to lodge at either of its neighboring cities. Its main building, the DAIBUTSUDEN is reported to be the biggest wooden building in the world (from the picture, it's hard to doubt, yah?). Also features KOFUKUJI TEMPLE which has a 5-tiered pagoda. Nara is a small city in comparison with its neighbors Osaka and Kyoto. Getting around central Nara where all its popular attractions are located involves either walking or taking the bus. This is a good alternative particularly if you will be arriving at Kintetsu Nara Station. From that station, getting to the western edge of the park will only take a 3-minute walk. 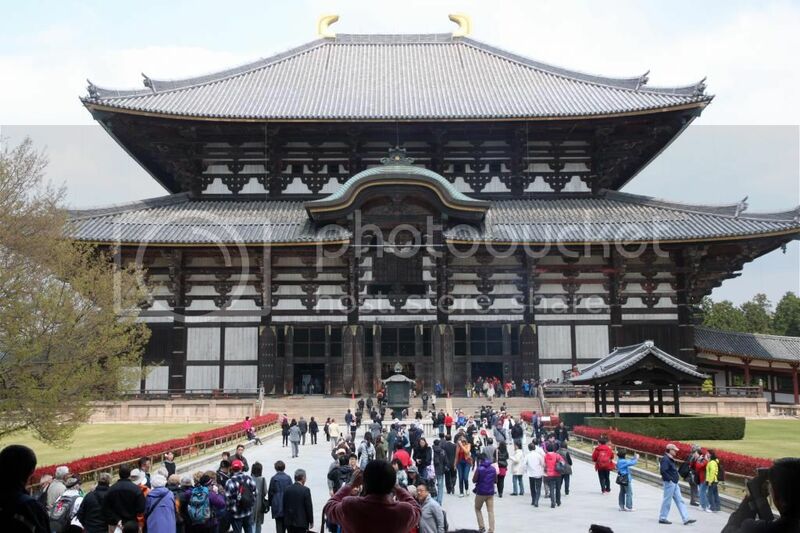 The Todaiji Temple? A reasonable 20 mins. Those times dont include stopping for selfies or to pet the deers. If coming from JR Nara Station, add 10-15 mins to those times. Still, not bad! Picture taken from apes-ies-sest.org's website. credits to them. Nara has numerous bus routes. However, the ones that tourists should concern themselves with are the loop buses. Take Loop Bus No. 2 if coming from JR Nara Station and Kintetsu Nara Station going to the Park and Todaiji Temple. You can board this at bus stop no. 1 in front of either train stations. Take Loop Bus No. 1 after sightseeing and returning to either train stations. Making an itinerary for a visit to Nara is straightforward. 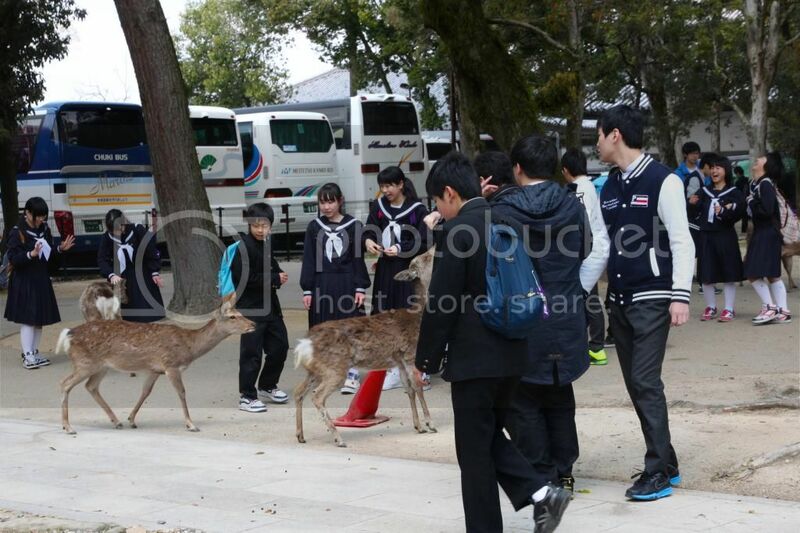 You train in ➔ you go see the Todaiji Temple ➔ go roam the park and feed the deer ➔ and go back to where you came from. Allot half a day, unless you want to see the other lesser-known temples. In which case, spare another 2 hrs. or three. By my account, Kobe is not as famous a side-trip destination from Osaka or Kyoto as Nara. I attribute this to the fact that the city doesn't have an attraction like Nara's Todaiji that tourists would travel to see. What Kobe does have is the world-famous, eponymous Kobe Beef, arguably the best beef you can taste.. There are several train companies that can transport you to Kobe from either Osaka or Kyoto. Leading the pack is, as always, Japan Rail (JR). You can reach Kobe via JR from both Osaka and Kyoto by riding either the shinkansen or any of their other trains. It offers the fastest way to get to Kobe, the shinkansen notwithstanding. Another rail company that offers transport between Kobe and both Osaka and Kyoto is Hankyu Rail. A third rail company that services Kobe but only from Osaka is Hanshin Rail. As mentioned at the start, for many, the attraction of Kobe is the beef. Image taken from http://japan.tourismsee.com. Credits to them. The closest station is the Minato-motomachi Station on the Kaigan Subway Line. How to get here: The nearest station is Kobe station of both JR and the Kaigan subway line. The latter is also known as the Harborland station. Shin-Kobe Ropeway: Cable car ride up the mountain behind Shin-Kobe station for unparalleled views of the city. How to get here: The closest station is the Shin-Kobe station. This station is connected to Sannomiya by the Seishin-yamate subway line. 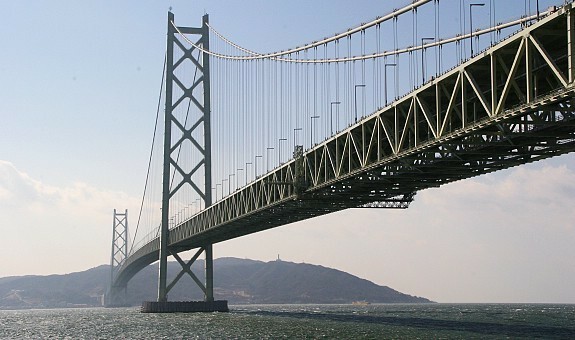 If you are impressed with engineering marvels, a trip to the Akashi Kaikyo Bridge, reportedly the longest suspension bridge in the world at 4 kms., can be worth your while. Taken from japan-guide.com. Credits to them. In the vernacular, "Tinatanong pa ba yan?" 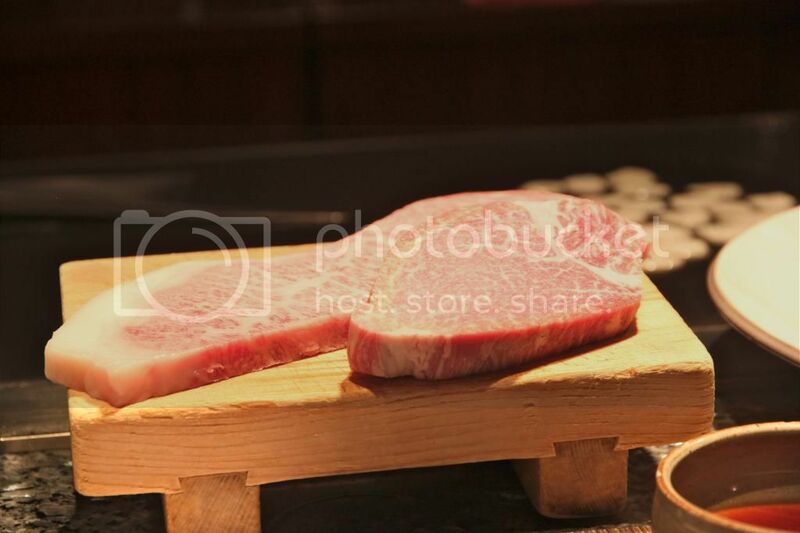 Kobe Beef, cuts of sirloin (left) and tenderloin (right). Aside from the usual staples of Japanese cuisine, people flock to Kobe to go to the source of Kobe Beef. Whether you think of it as hype or not, trying this delicacy at least once in your life is a worth-while endeavour. Steakland: just across the Hankyu Sannomiya station. The building that houses 2 of the 3 branches of Moriya. ☞ Tip: Lunch sets are cheaper than dinner sets. ☞ Tip: It is fine to walk-in but, you run the risk of a full house (the restaurants aren't that big). It is recommended that you make a reservation on line. Image from diversitytravel.co.uk's web page. Credits to them. 2 elevated light rails, the Port liner (red) which connects the city to the port and Kobe airport, and the Rokko liner (green), connects Rokko island to the city. The term Sannomiya station, just like Namba station and Umeda station, is used to describe several stations that are drop off points of several train and subway lines. Image taken from the harukapat.jp website. Credits to them. Please note that, just like Osaka, Kobe has a Kobe station and a Shin Kobe station, the latter being where the shinkansen stops. A convenient way of going around Kobe. Single-ride tickets are at ¥250, the day pass is ¥660. Not sure if you can use your IC card to pay. If by going here you are planning to partake of some Kobe Beef, your itinerary should center on lunch and dinner times. An example of an itinerary would be to go to Himeji in the morning, and proceed to Kobe after. If you get to Himeji when the castle opens, you can probably catch (a late) lunch at Kobe. If you take a more leisurely approach and arrive at Kobe in the afternoon, you can probably take in one attraction (eg. Meriken Park) and proceed to dinner after. Himeji is known for its castle, reputed to be Japan's most beautiful. One can take a JR train, sinkansen or otherwise, from both Osaka and Kyoto. Those coming from Osaka have the added benefit of traveling via Hanshin Rail. Image taken from famouswonders.com. Credits to them. HIMEJI CASTLE ...need I say more? Apparently I do. How to get here: From either of the 2 Himeji stations, walk 20 mins. north along Otemae dori till you reach the castle grounds. Bus and taxis available, too. This should be straightforward, you come in to Himeji town, visit the castle, and leave Himeji back to possibly for Kobe, or Hiroshima, or back to Osaka or Kyoto. Nagoyas Sakae district. Photo mine (rdvd). All rights reserved. Toyota-related museums  There are 3 scattered in different locations in Nagoya: Toyota Kaikan Museum, Toyota Techno Museum (aka Commemorative Museum of Industry and Technology), and Toyota Automobile Museum. Toyota Techno is the most accessible, being the first stop on the Meguru bus loop and within Japanese walking distance from Nagoya Station. Nagoya Castle: Reconstruction of the original castle. Open to visitors but there are renovation works until 2018. Accessible via Meguru bus loop or via subway to Shiyakusho station. One day Bus and Subway Pass (850 yen)  unlimited rides on subways and buses (and Meguru loop bus) on 1 day. Donichi Eco Ticket (600 yen)  discounted version of the One day Bus and Subway Pass, only available on weekends and national holidays, and 8th of each month. Toica  Prepaid IC card sold by JR similar to Tokyos Suica and Osakas Icoca. 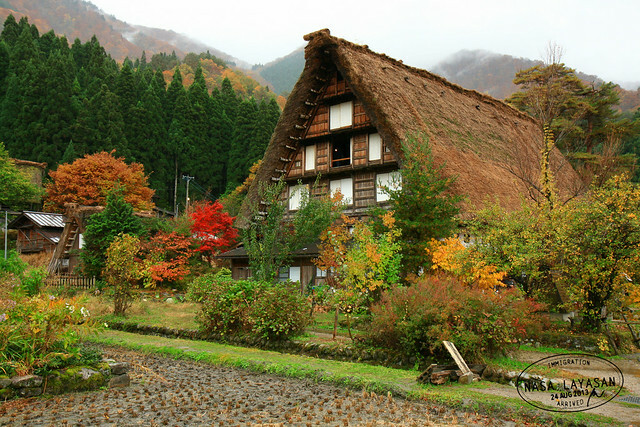 Gassho-zukuri farmhouses in Shirakawago. Photo mine (rdvd). All rights reserved. Gassho-zukuri traditional houses  Centuries-old farmhouses collectively inscribed on the UNESCO World Heritage list, There are 3 villages: Ogimachi (the largest and most visited), Ainokura, and Suganuma. In addition, the Hida Folk Village (Hida no Sato) in Takayama also has Gassho-zukuri houses in an open air museum style. Nagoya is the usual jump-off point to Takayama and Shirakawago. See how to get to Nagoya from Tokyo, Osaka or Kyoto in the Nagoya section above. Keio Highway Buses depart from Shinjuku West Exit (5.5 hours, 6,690 yen). Official site and timetable. Hiroshima Peace Park. Photo mine (rdvd). All rights reserved. 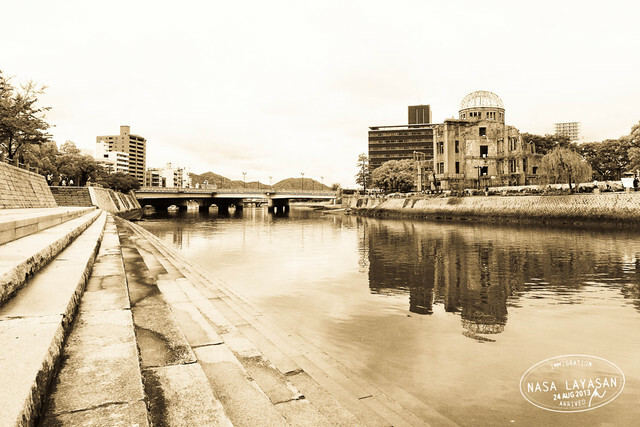 Hiroshima Peace Memorial  Composed of 2 major sights: Peace Memorial Museum and A-Bomb Dome, and a handful of smaller monuments dedicated to peace and nuclear disarmament. Itsukushima Shrine (Floating Torii) at Miyajima  classical Japan postcard photo. The torii will only be "floating" at high tide, but at low tide you can walk to the torii. Check tide levels here. Trams/streetcars are the main mode of transportation in downtown Hiroshima. The main sights are very much accessible by tram for a flat rate of 160 yen per ride. Note that ICOCA are accepted on trams, but SUICA/PASMO are not. Maple-oop Bus (JR Loop bus) - Green line is useful for going from Hiroshima station to Peace Park and back, Orange line is useful for Shukkeien Garden and Hiroshima Castle. One-day Pass (600 yen)  unlimited tram rides except tram line to Miyajimaguchi on 1 calendar day. Buy if you plan to take the tram 4x or more in a day. Sapporo Snow Festival in February. Photo mine (rdvd). All rights reserved. 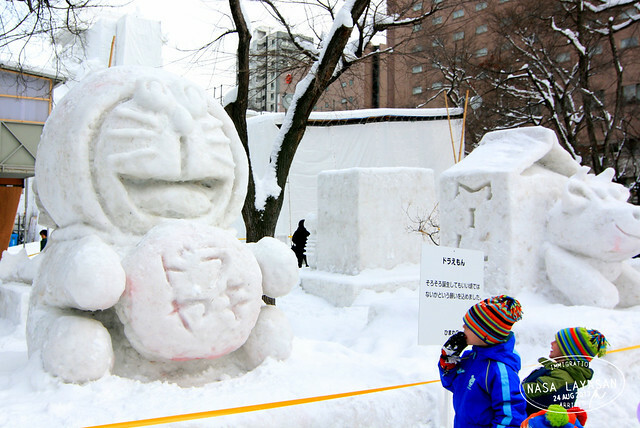 Sapporo Snow Festival  huge snow and ice sculptures concentrated in Odori Park and Susukino district. A 3rd site in Tsudome specializes in snow activities geared mostly toward kids (and the feeling kids). The festival is held every 2nd week of February. By Train: not recommended for those with short itineraries as the fastest rail trip will take 10 hours and 2 transfers along the way. The one-way cost (24,000 yen) will almost cover the price of a 7-day Japan rail pass (29,110). By Train: not recommended for those with short itineraries as the fastest rail trip will take 13 hours. The one-way cost (33,000 yen) exceeds the price of a 7-day Japan rail pass. Subway 1-day Card (800 yen)  1 day use of subways in Sapporo. Donichi Subway Ticket (500 yen)  discounted version of Subway 1-day card available only on weekends and holidays. Hi everyone, worth it ba bumili ng 7 days JR pass for Tokyo, Kyoto and Osaka na 8D/7N? If not, anong pass ang maganda? TIA! Hi Kanski, our route would be MNL-NRT KIX-MNL. We'll stay in Tokyo for 4 days and the remainder in Osaka. We'll spend 1 day in Kyoto. We want to try Shinkansen going to Tokyo and Kyoto. TIA! don't purchase the pass, just buy a ticket when you ride the shinkansen.